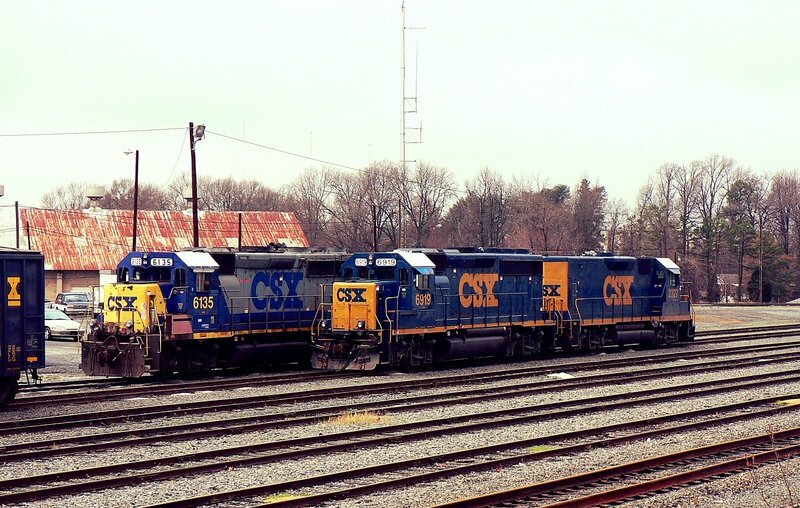 During my years of working at Charlotte, I have been fortunate to witness and photograph a considerable amount of CSXT activity in and around Pinoca Yard. 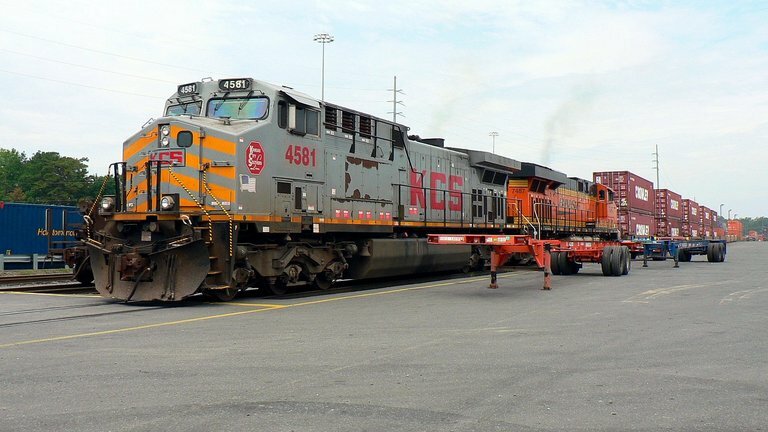 The hands of change have not left this area untouched---upgrades to the intermodal ramp, track realignments, and the addition of signals within the former yard limit region has transformed the overall appearance. 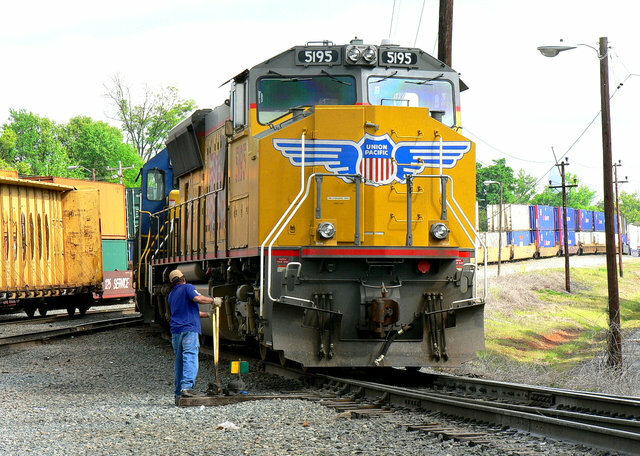 Operational changes include the addition of two more intermodal trains and the variety of motive power within the past decade. 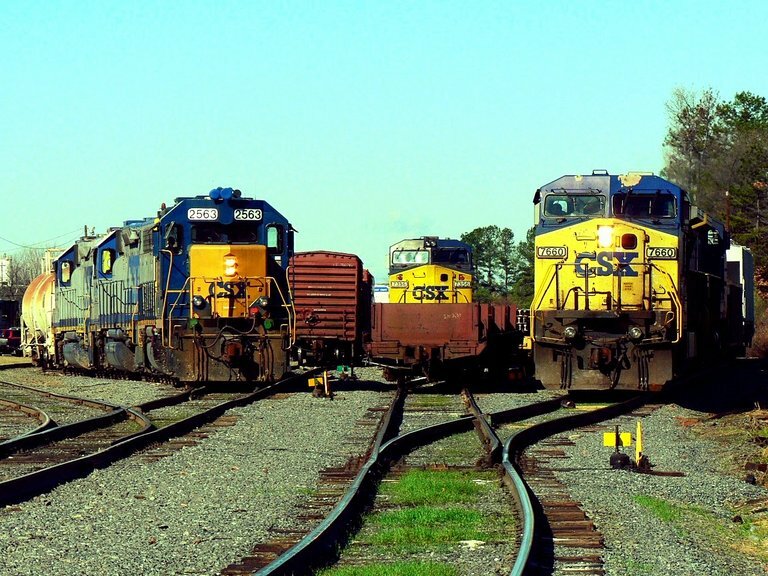 With each passing year, standardization has become more or less the rule of the day. 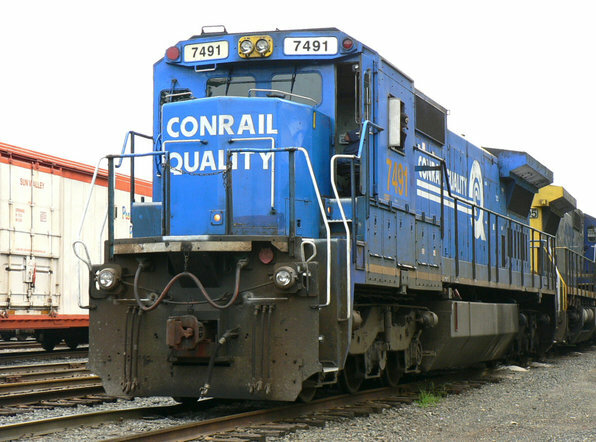 At one time, a good sampling of older EMD power would be common on the "pig" trains as well as locomotives still sporting Conrail blue and leaser marks. 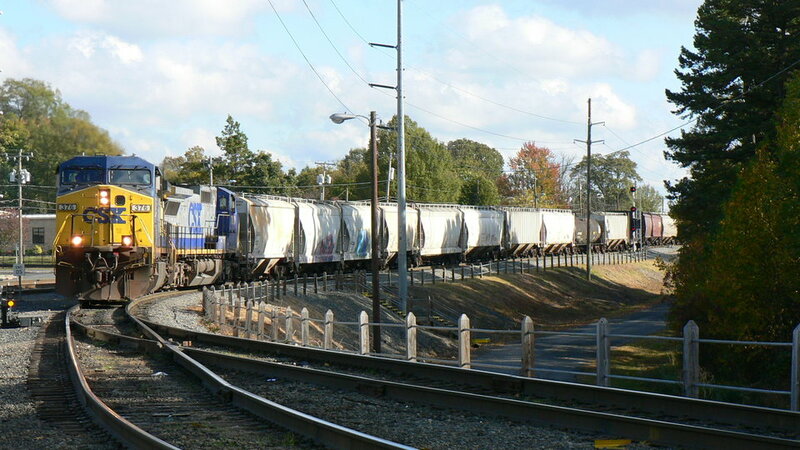 Although EMD units are obviously still common for yard and local use, their frequency has definitely declined on the road trains. 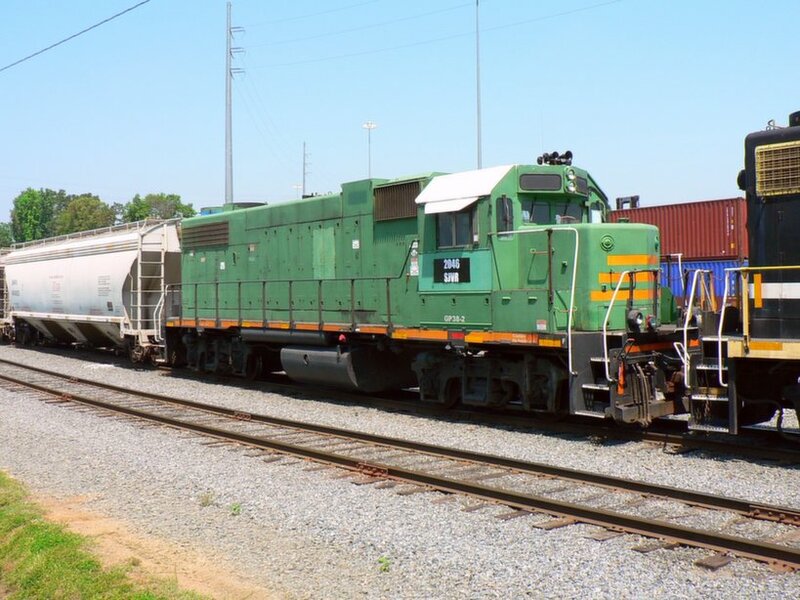 Today the rule of thumb is two GE units on the pig trains occasionally interrupted by the appearance of foreign road power. 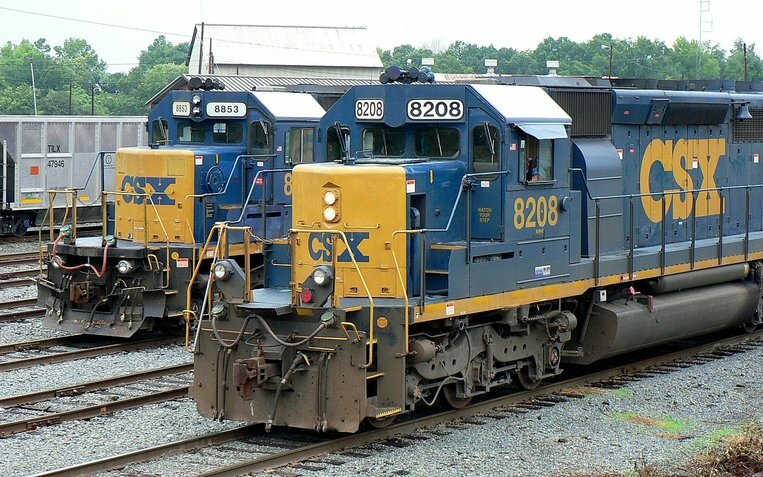 Keeping with the theme of eventual uniformity, the number of CSX locomotives in earlier paint schemes continues to decrease daily as the fleet transforms to the current YN3 and variant (Dark Future) appearance. 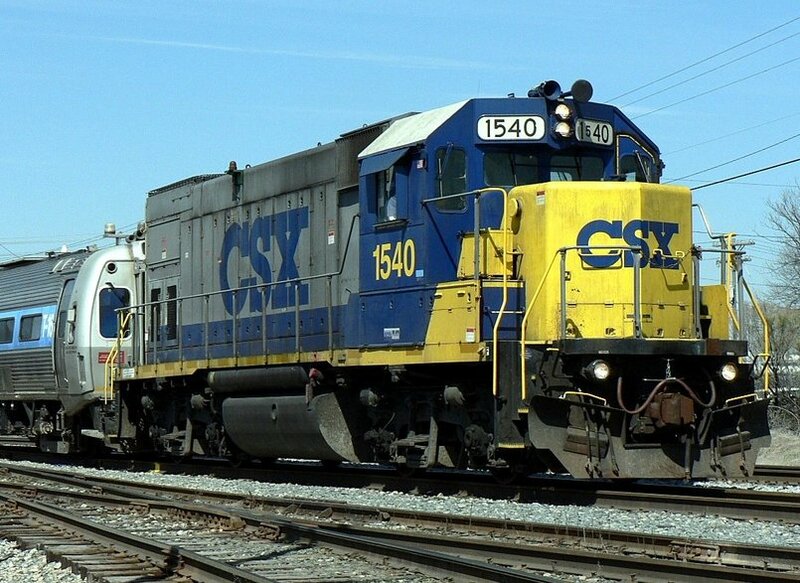 Obviously, this transformation is not only confined to Charlotte as it encompasses the entire CSXT network as a whole. 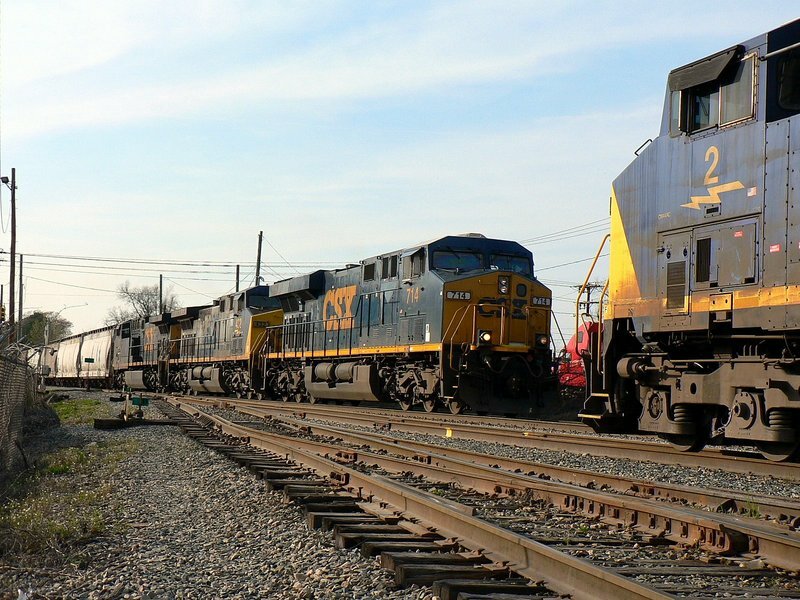 Included on this page are various images taken either at Pinoca Yard or the intermodal ramp with a sprinkling of other scenes such as mainline trains passing through. 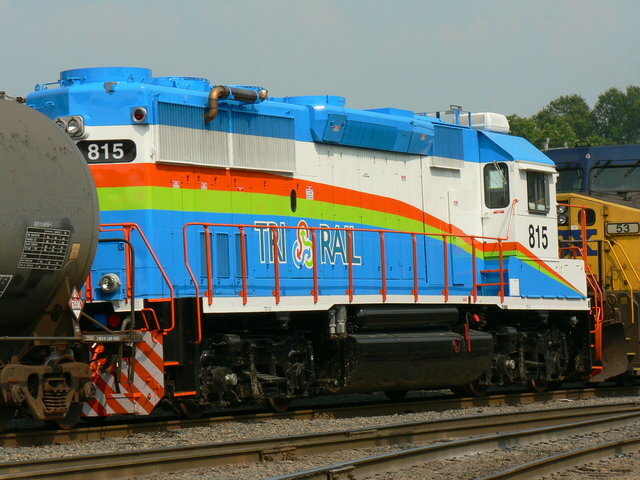 Locomotive roster shots are also added as representations of particular models or paint schemes. With a large number of images taken here choosing ones to insert is difficult but hopefully a balance can be achieved in the presentation. 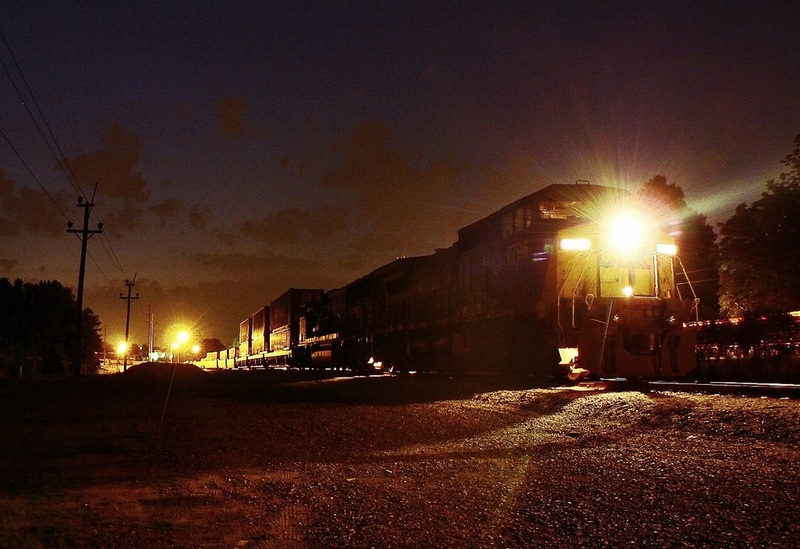 As simply a novice photographer, the quality of these images will vary considerably. 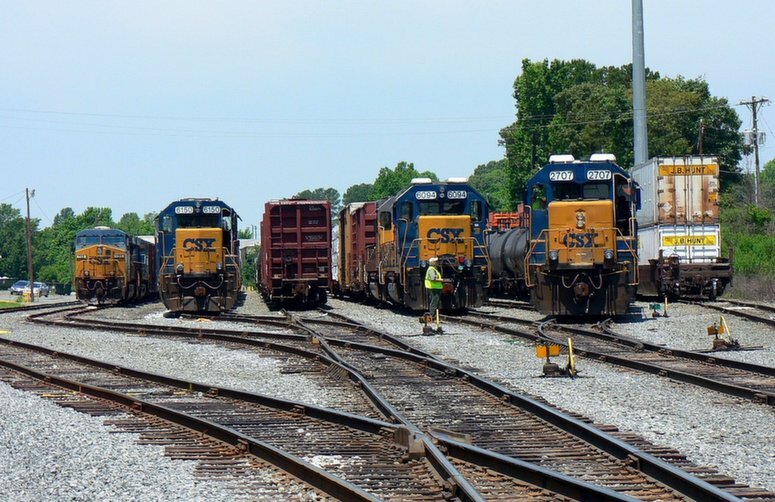 Finally, Charlotte images used elsewhere on WVNC Rails will not be replicated here. 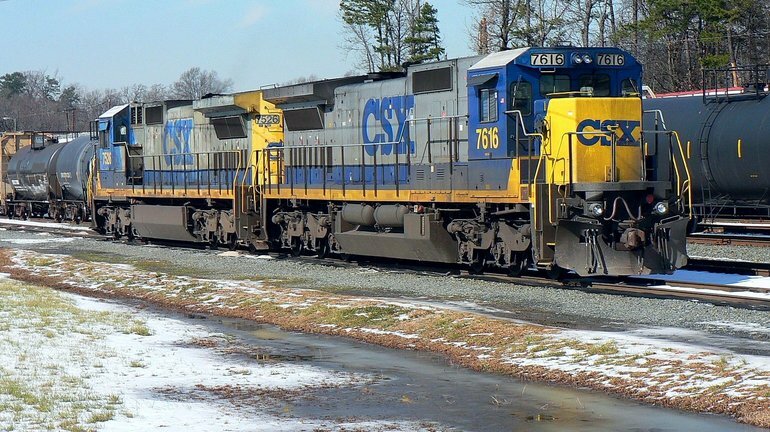 Operations at Charlotte during the past decade have basically been a reflection of economic trends and system reclassification of train numbers. 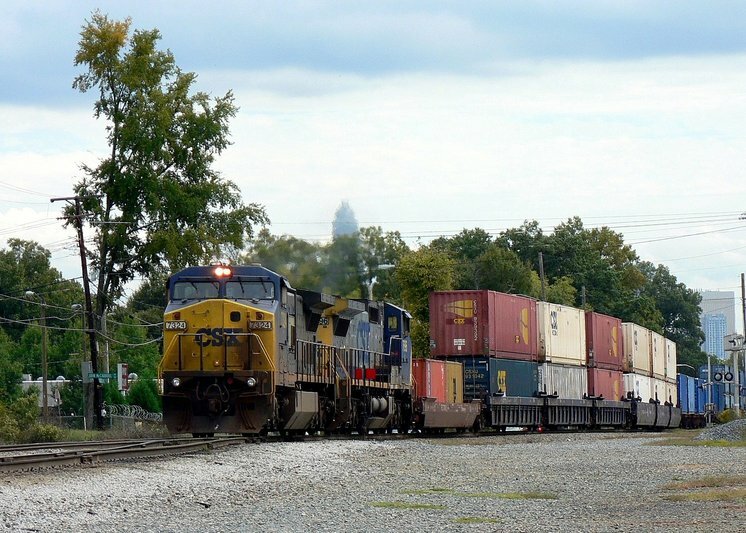 In 2006, the intermodal terminal received an inbound Q194 from Atlanta and the outbound counterpart was Q199. 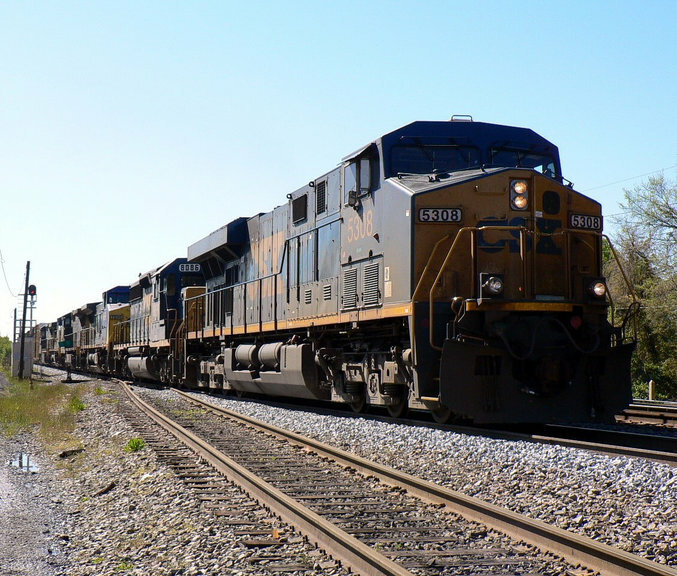 By 2012, the outbound train was changed from Q199 to Q195 with a L195 operating on Saturday. 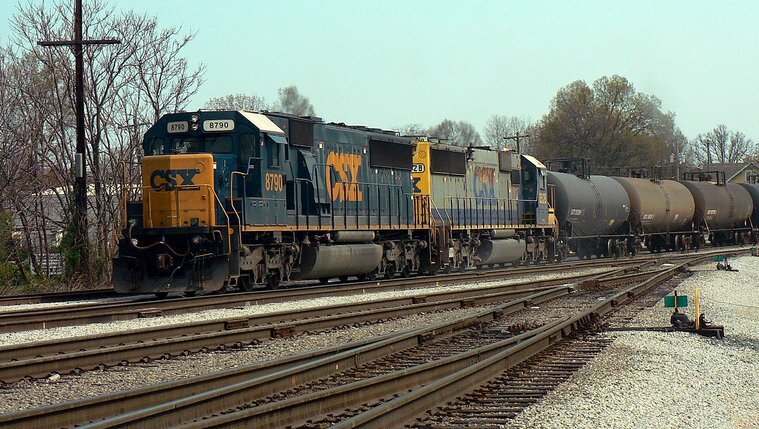 A Sunday Q195 was also added during this time period. 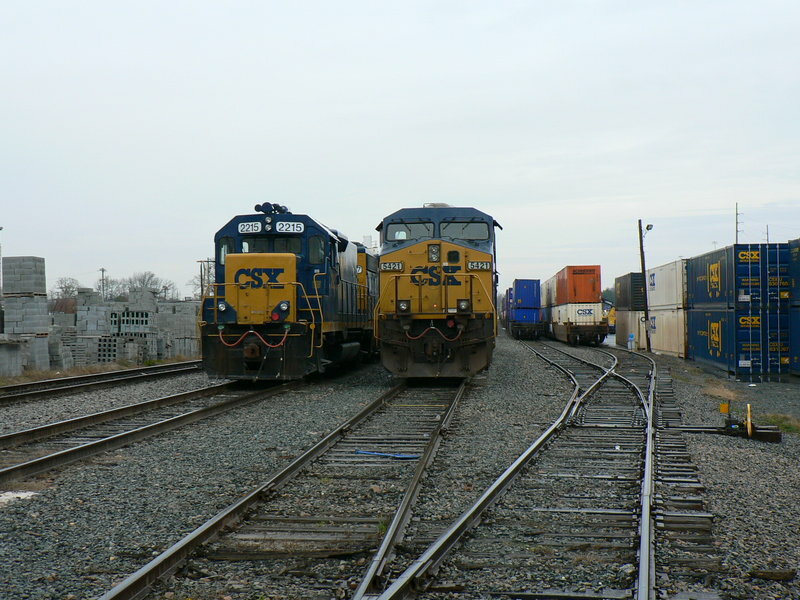 2008 saw the inauguration of the “Threads Express” intermodals running between Charlotte and Jacksonville with cuts for Savannah. 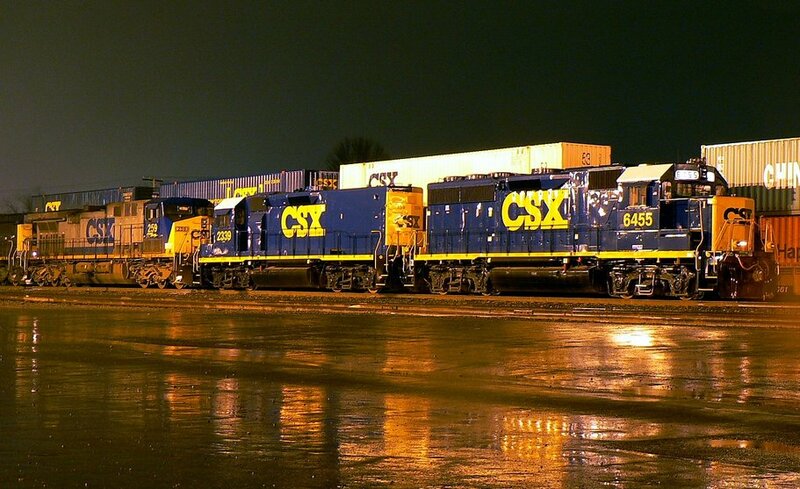 This freight changes hands to and from the Florida East Coast (FEC) with traffic for and from Fort Lauderdale and Miami. 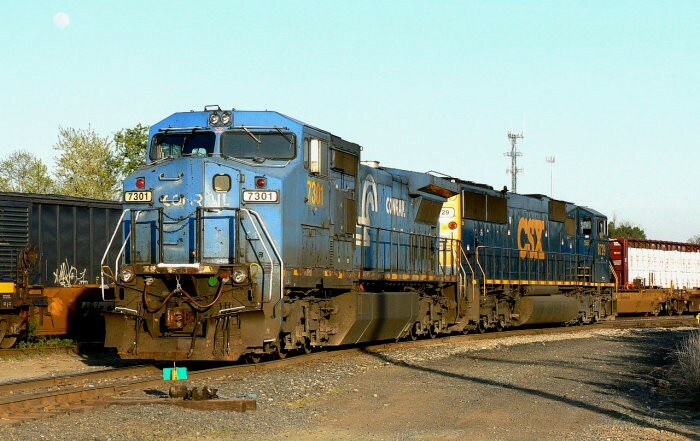 Initially, these trains operated under the Q181/L181 and Q182/L182 symbols until a system wide reclassification renumbered them as Q037/L037 and Q038/L038/Q040. 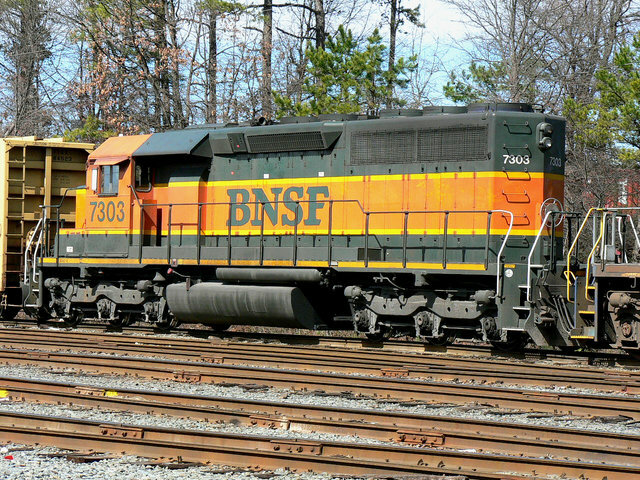 On the freight side, F767/ F768 operated as Charlotte-Hamlet turns until 2009. 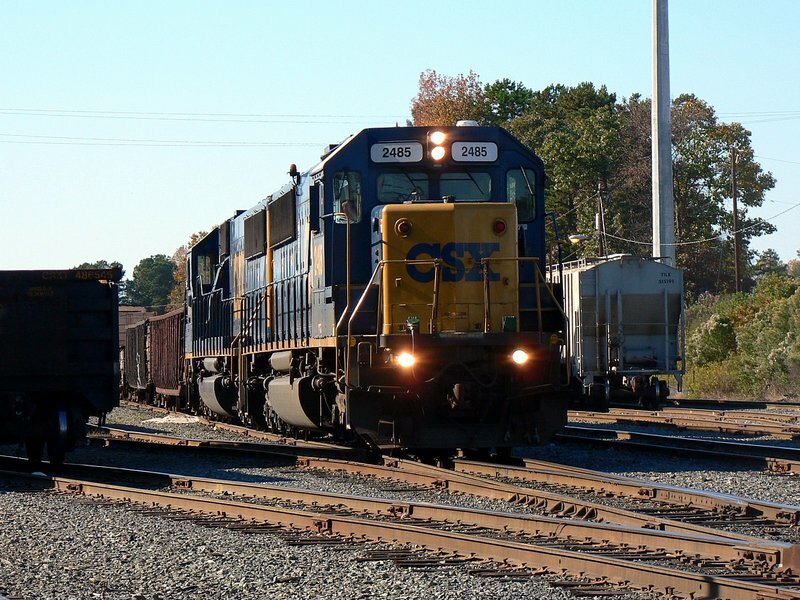 The economic crash of 2008 temporarily abolished these trains and Q696 and Q697 were blocked with cuts of cars to and from Charlotte. Once reinstated in 2010, F767 was changed to F769 but F768 remained the same. 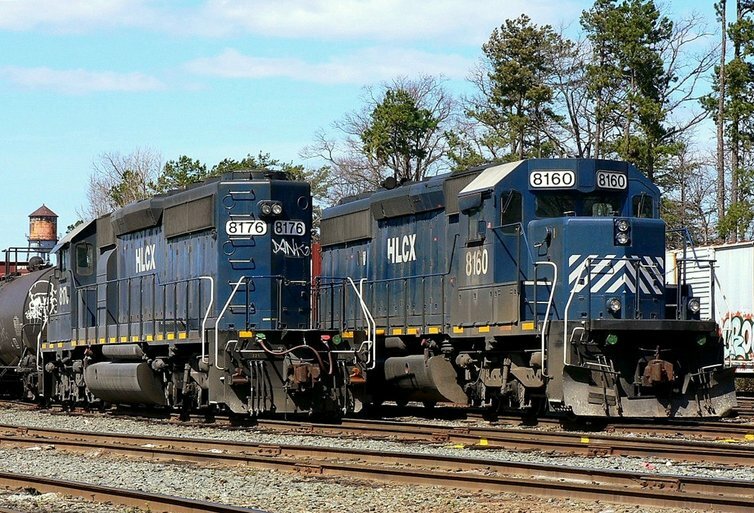 During 2012, these two trains were reclassified as Q468 and Q469. 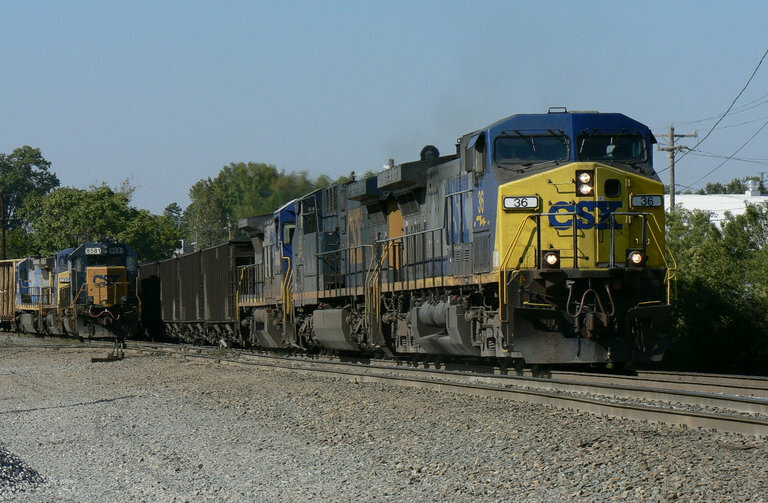 Run through trains include Q696 (Russell, KY-Hamlet), its counterpart Q697 (Hamlet-Russell), and Q698 (Cincinnati-Hamlet). 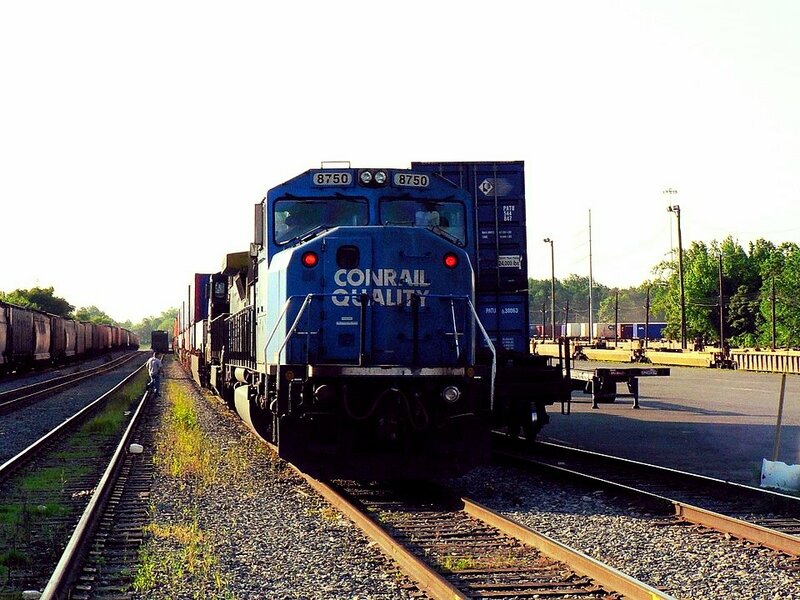 Until recently, a counterpart Q699 (Hamlet-Cincinnati) operated but at the time of this writing, has been abolished. 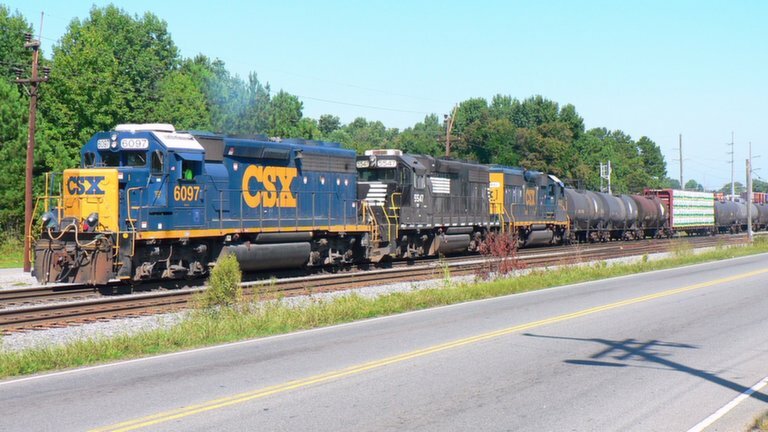 One constant in a flux of changes has been F793, a Charlotte-Mount Holly turn that will operate as far as Lincolnton as needed. 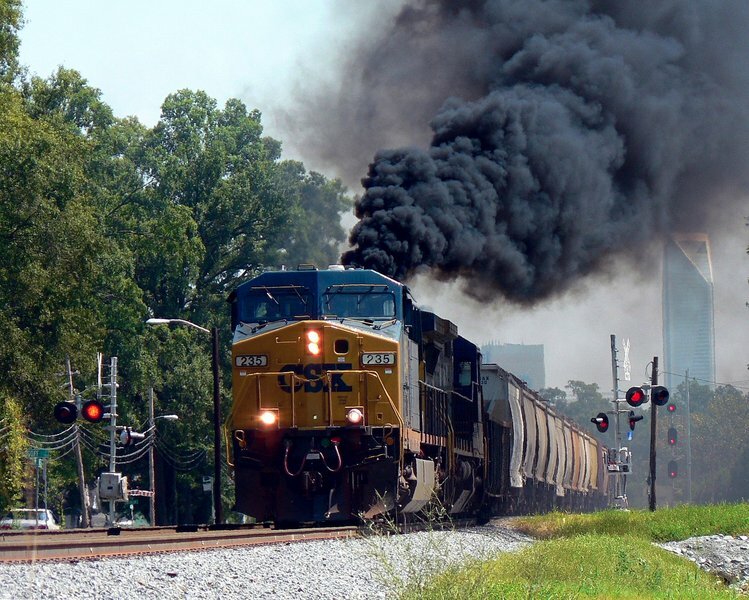 Coal loads and empties still pass through on the main although fewer in number than 2006.The loss and reductions at Riverbend and Marshall on the Terrell Sub from Mount Holly has impacted coal traffic volume drastically. 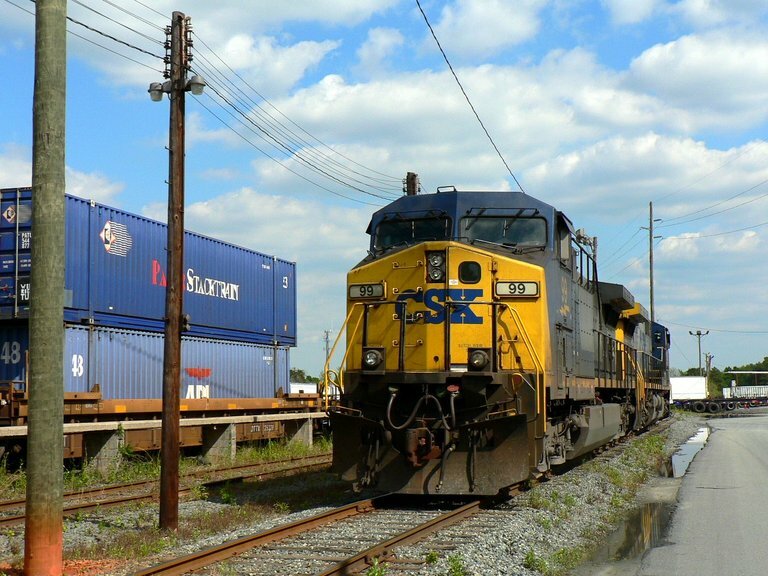 Conversely, in recent years grain traffic through Charlotte has increased. 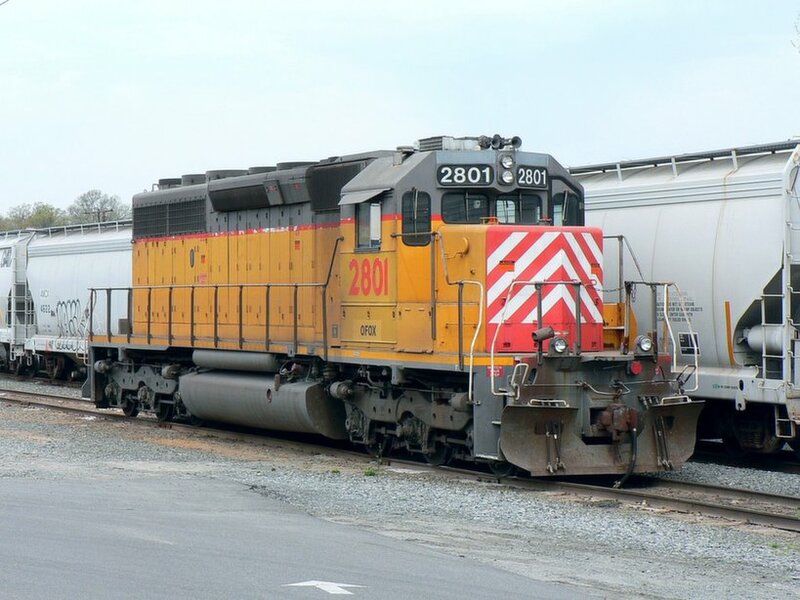 Local turns out of Pinoca serve the West Industrial Park and the former P&N Chemway Park in addition to customers scattered elsewhere along the mainline. Beginning in 2008, the winds of change blew forcefully shaping changes to come. 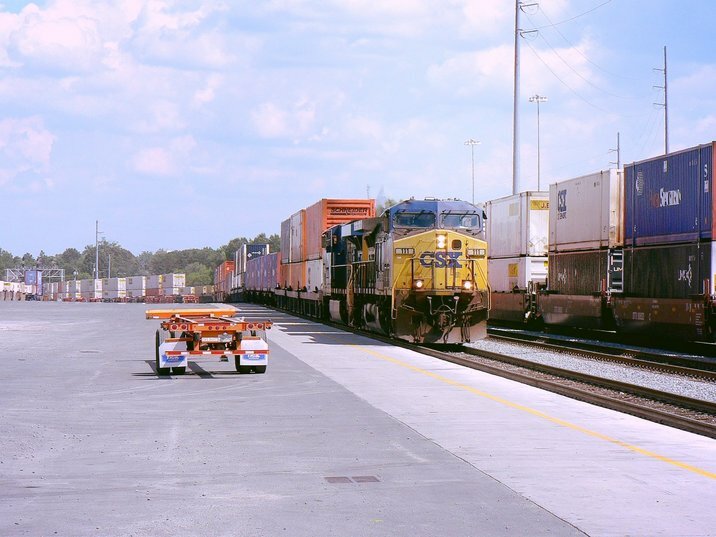 The first upgrade occurred at the intermodal ramp with track extensions, a new office, and a reconfiguration of the layout within the ramp. 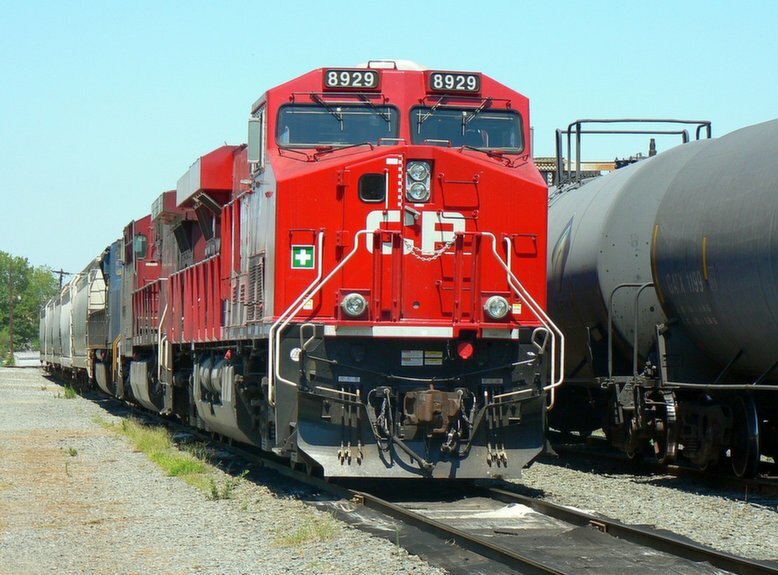 The greatest impact on operations, however, was the economic meltdown that occurred later in the year that affected traffic patterns. 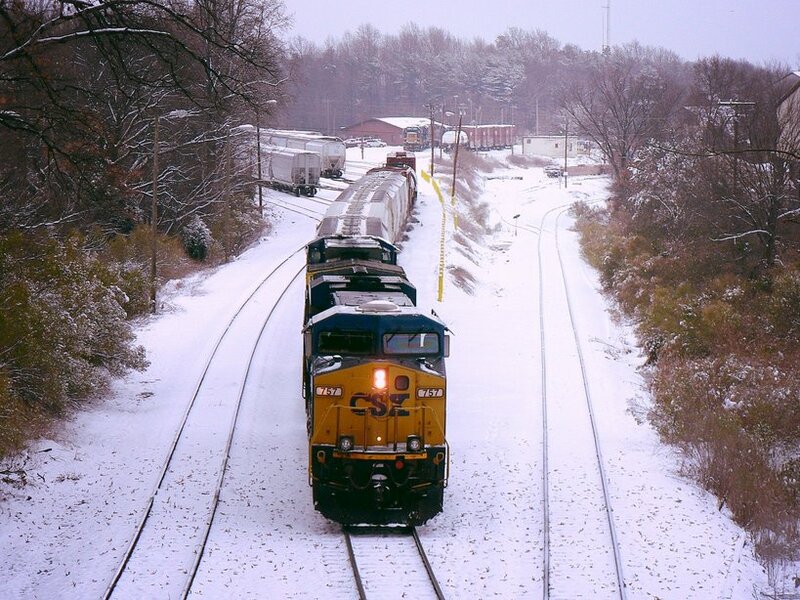 All facets of business were affected but the most negative impact was on manifest traffic. 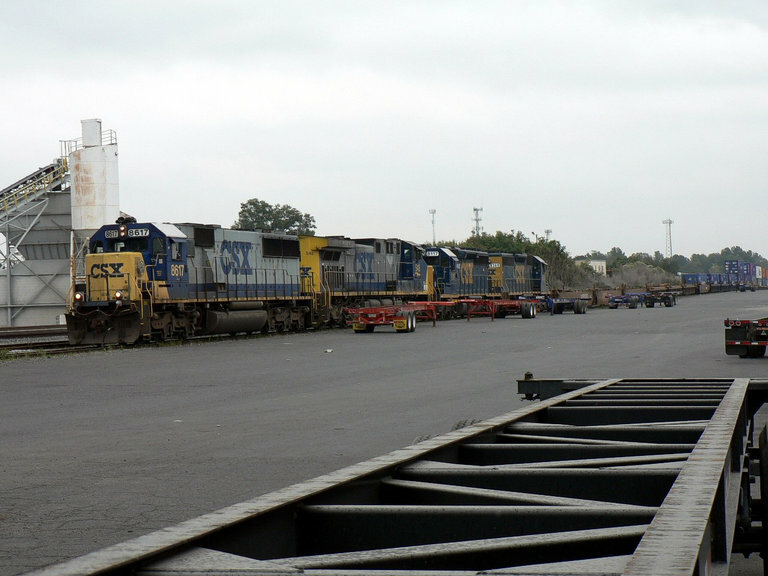 Car loads decreased and at times, Pinoca Yard could be barren of cars. The most noticeable difference was the abolishment of Charlotte-Hamlet trains F767/F768 by early 2009 due to decreased traffic. 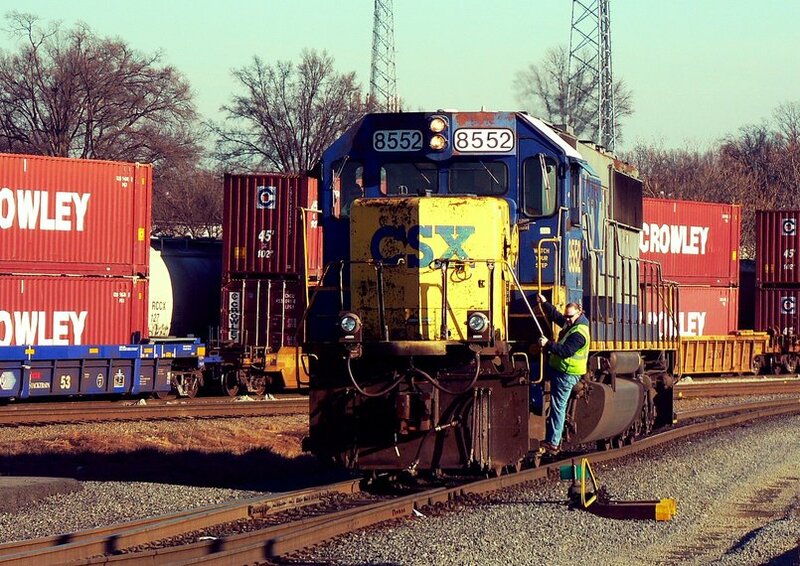 As a result, manifest trains Q696 and Q697 handled cuts of cars at Charlotte. 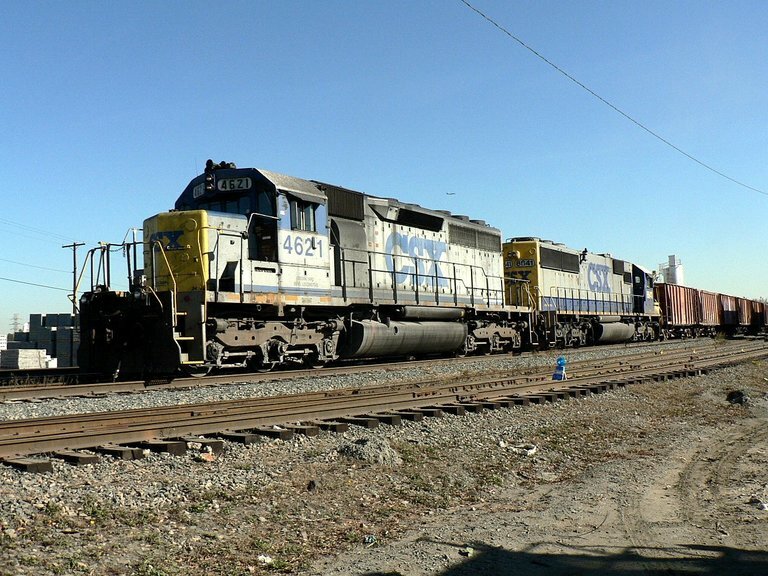 On a positive note, the addition of two intermodal trains helped to offset the manifest losses with respect to Pinoca activity. 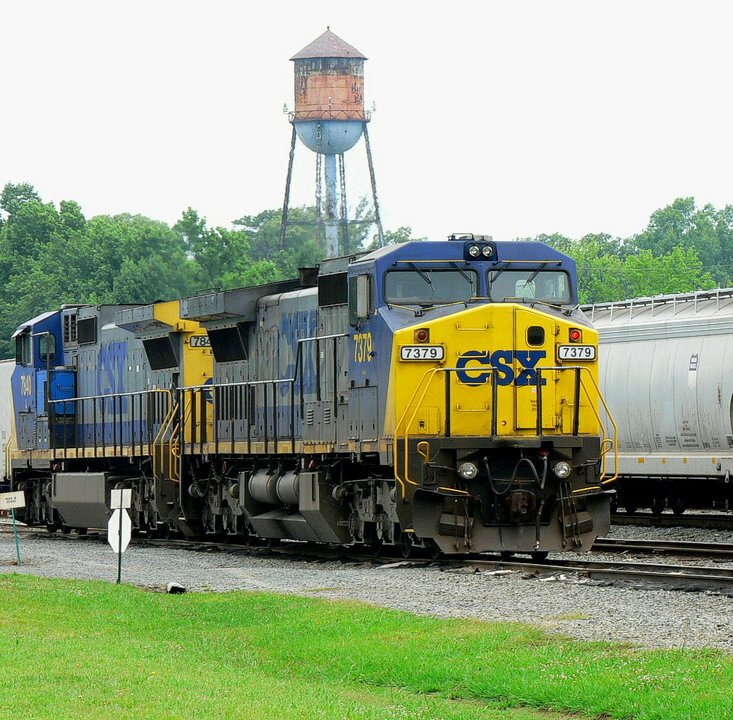 In June 2008, the Threads Express was introduced as high priority textiles in the Charlotte- Florida market in conjunction with the FEC. 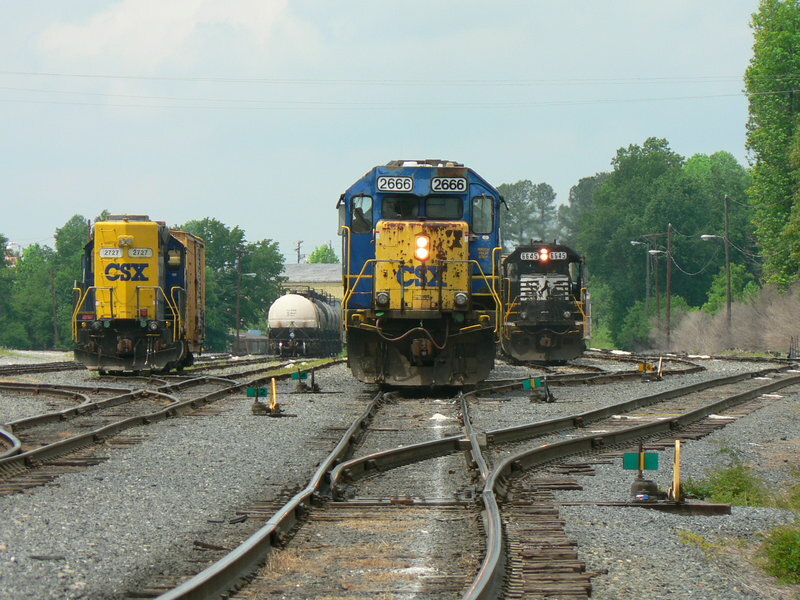 Also added with these trains was port traffic at Savannah and Charleston. 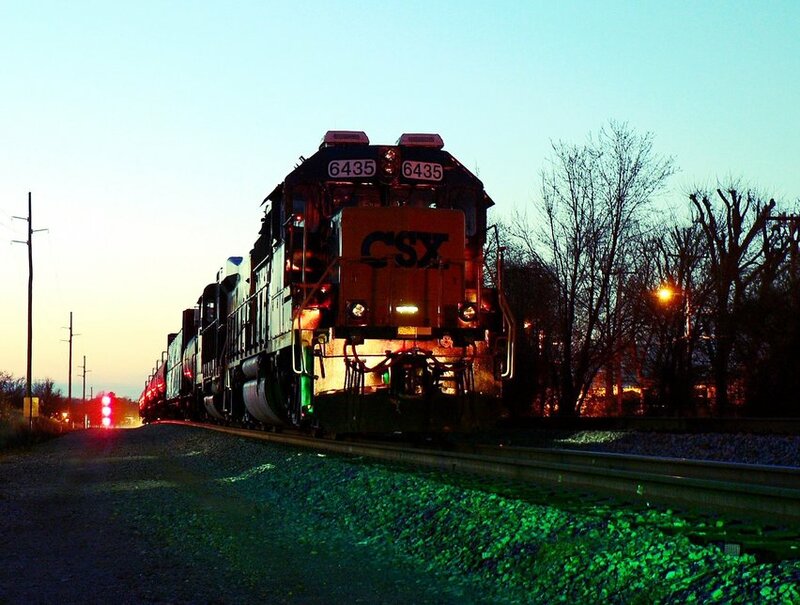 With implementation of the Q181/Q182 trains, the intermodal ramp essentially became a round the clock operation. 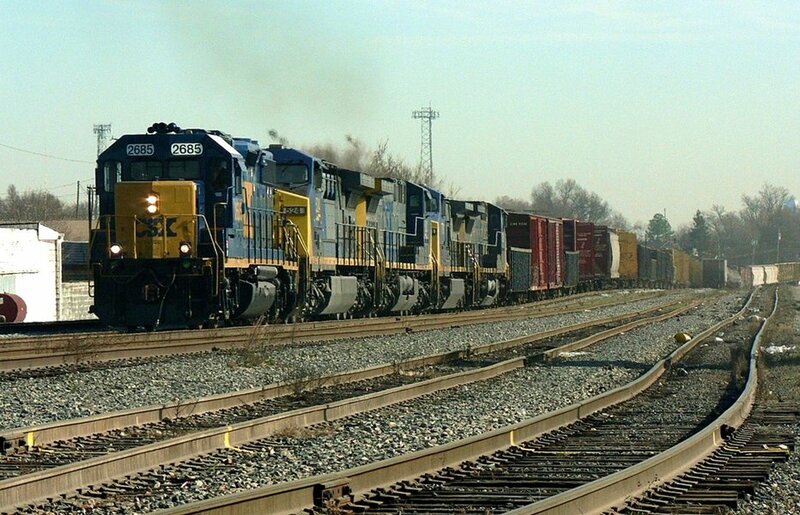 In the ensuing years, the volume of these trains has more than doubled. 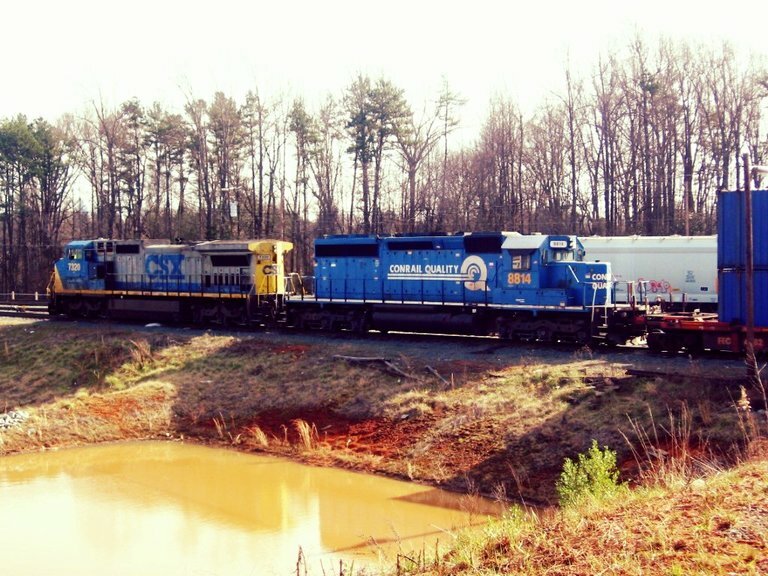 In the early spring of 2009, two new symbol trains were added that would pass through Charlotte. 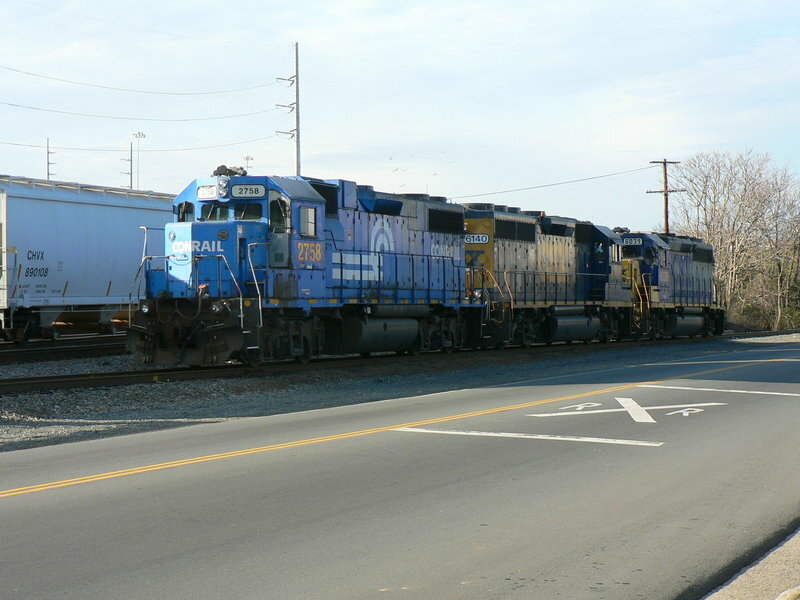 Q698, a Cincinnati-Hamlet manifest and its Hamlet-Cincinnati counterpart, Q699, became daily runs that boosted traffic on the Charlotte Subdivision. 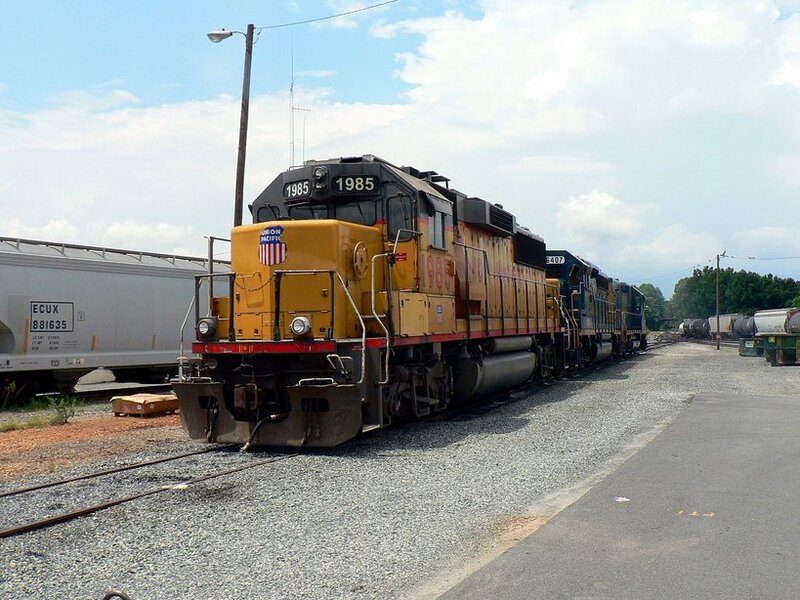 If on schedule, both would pass through town in mid-afternoon and meet to the railroad south at Shelby or Cherryville. 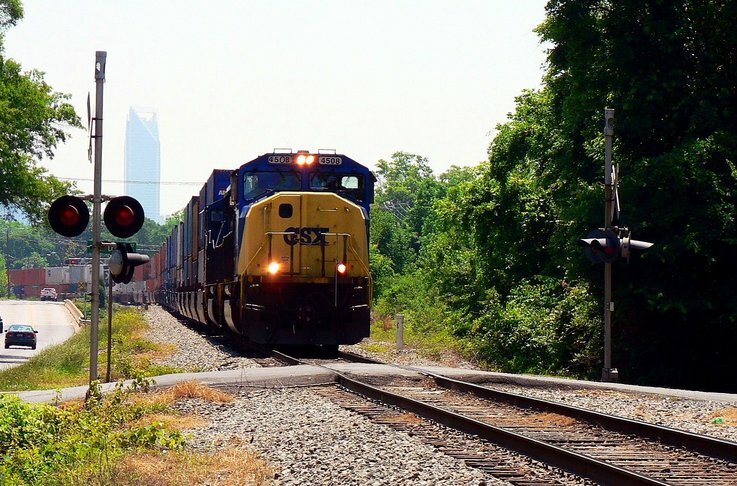 The routing of these two trains only lasted several months on the Charlotte Sub before shifting to a longer but quicker Cincinnati-Atlanta- Hamlet route. 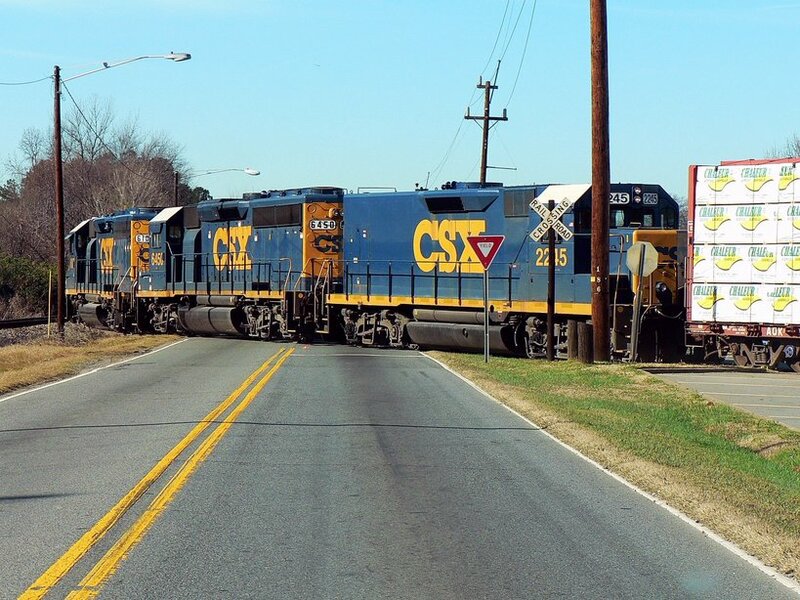 Occasionally, one or both would be rerouted through Charlotte but operations opted to leave them on the aforementioned route otherwise. 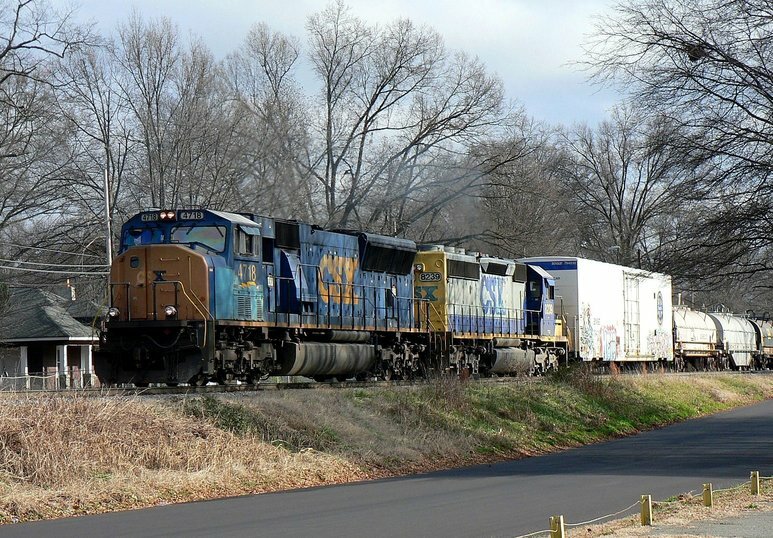 Later in the year, the Charlotte-Hamlet train F768 was reinstated along with its Hamlet-Charlotte counterpart although the symbol was changed from F767 to F769. 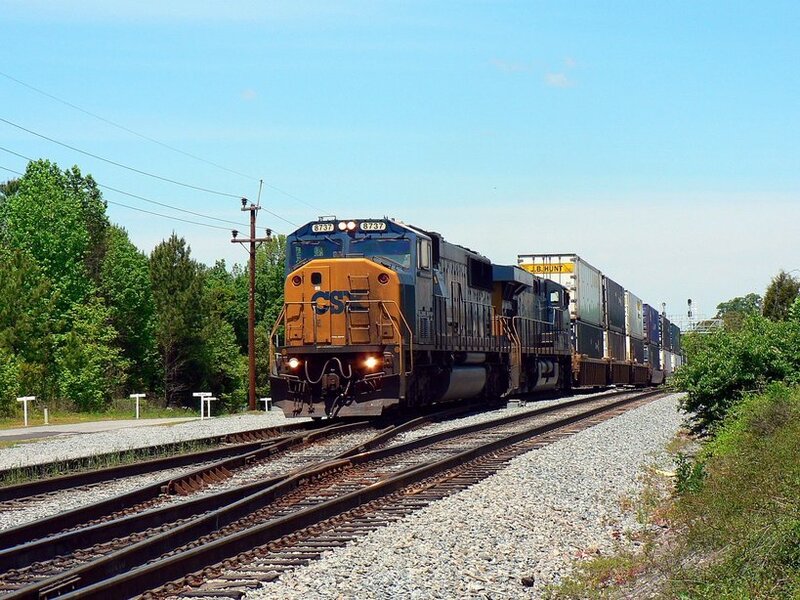 Their return was hastened by the delays to both Q696 and Q697 transit times as well as the impediment both caused at Charlotte affecting timely intermodal ramp switching and increased roadway traffic congestion. 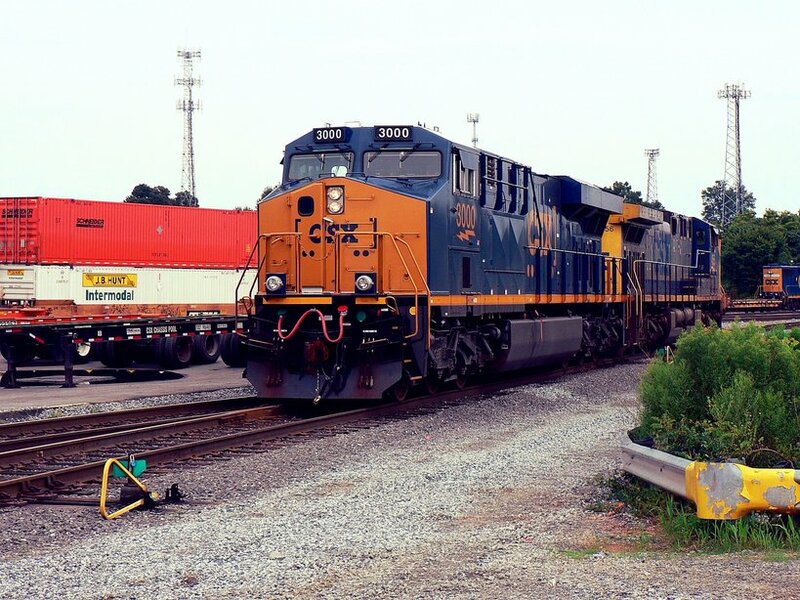 Completing its overnight run from Jacksonville, Q182 crosses over from the main as it will run the auxiliary track to enter the intermodal ramp. In the background is the Gothamesque Bank of America building that towers above downtown Charlotte. Dan Robie 2009. 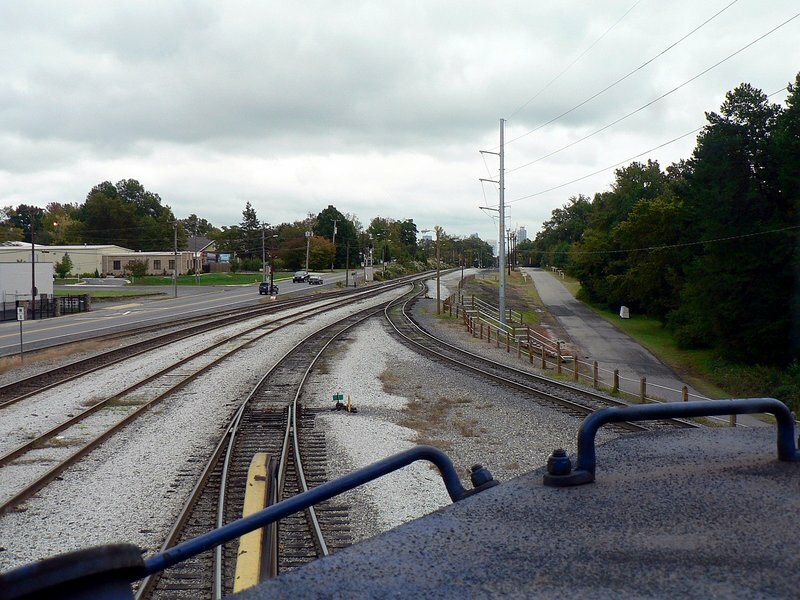 A railroad northbound view from the south end of the intermodal ramp. 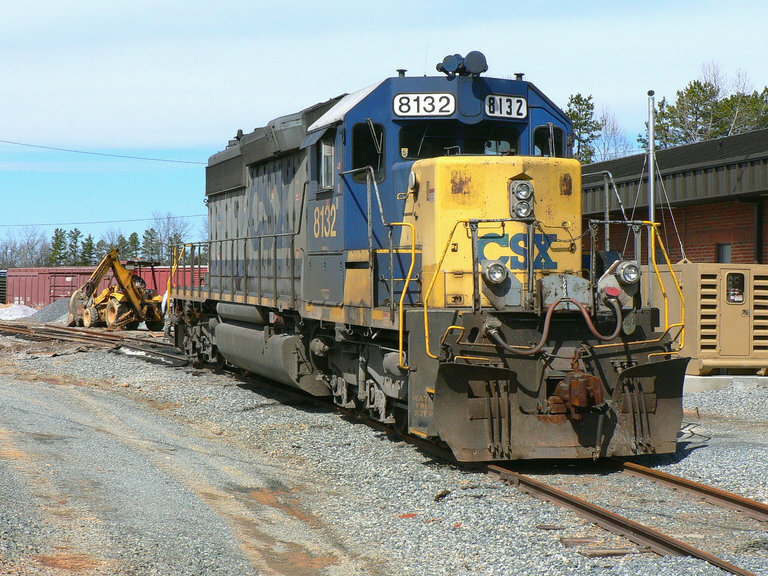 The #2215 is a road slug with a GP40-2 mother tied down on track P11. 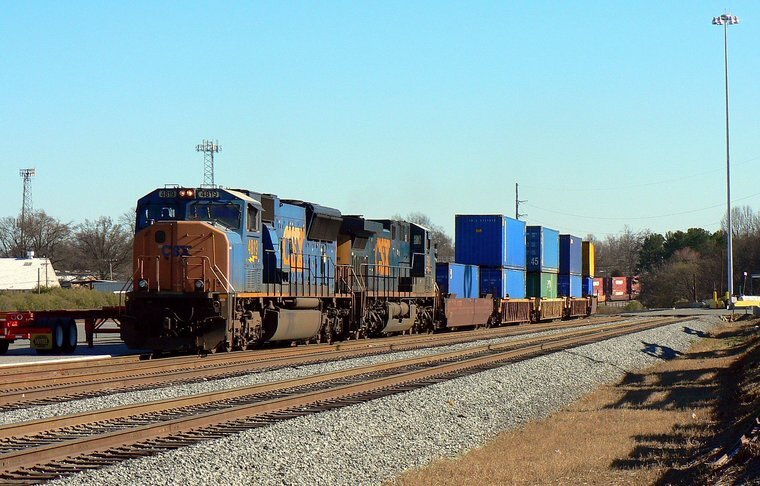 To the right is Q194 power on track P10 and the stacked CSXU containers are empties awaiting repositioning. Dan Robie 2009. In one major respect, 2009 was the photographic high water mark for me at Charlotte. I had previously taken large quantities of photos with the likes of roster shots and various configurations of power. But by 2010 the changes had become more obvious. 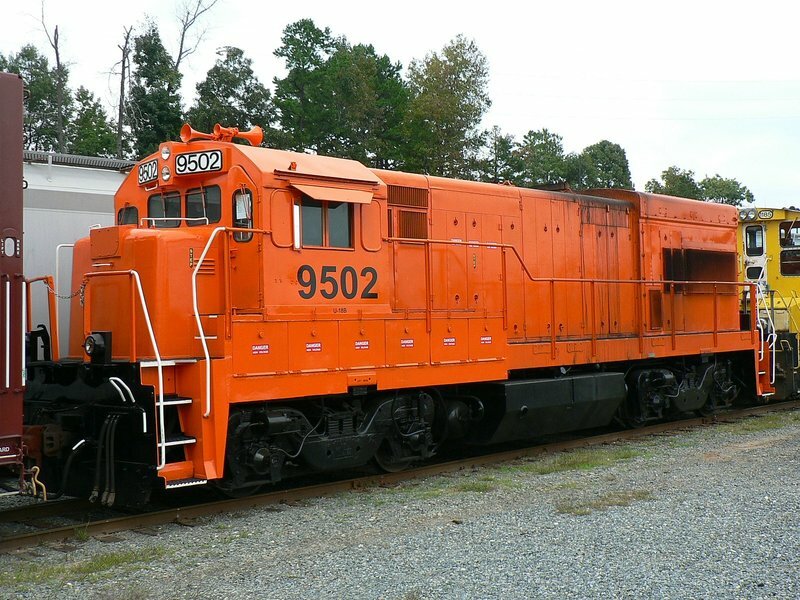 YN3 painted locomotives were prevalent and the number of foreign units/leasers and even classes of power diminished. 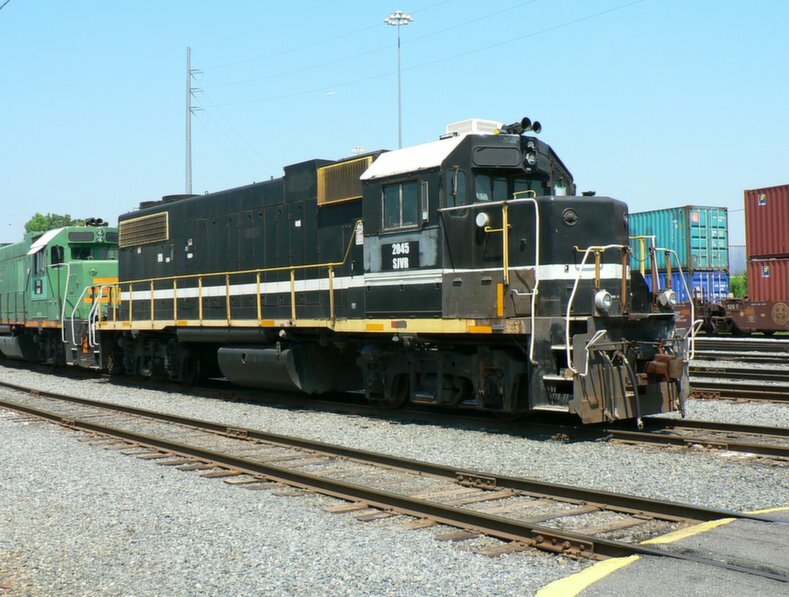 Not that I do not like YN3 (Dark Future) paint but when it combined with a daily dose of wide cab GE power became the predominant sight seemingly all the time, the interest waned. 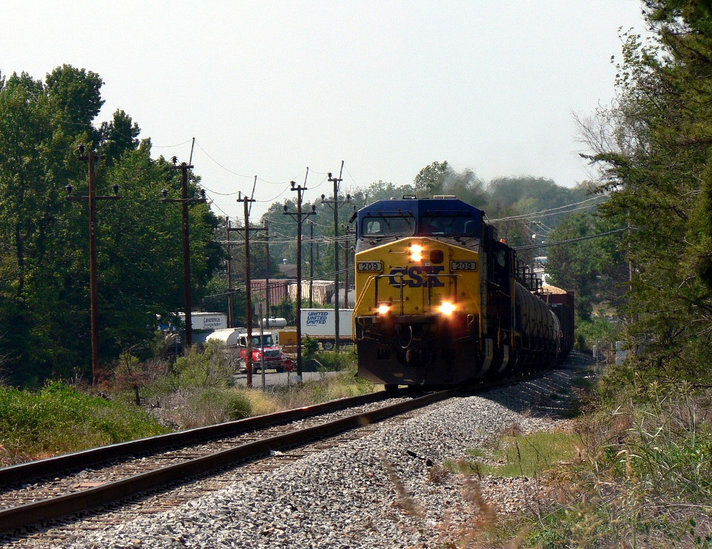 Not all was lost, however, as there would still be particular locomotives or scenes I hoped to capture. Unfortunately, there would not be as many as in the past, though. 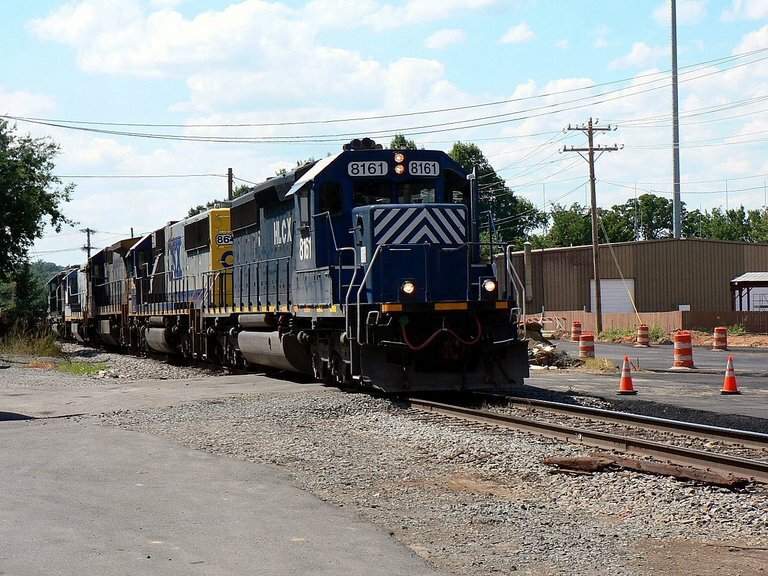 As the local shoves a cut of cars across Rozelles Ferry Road on the West Industrial Park track, Q696 moves past on the main. 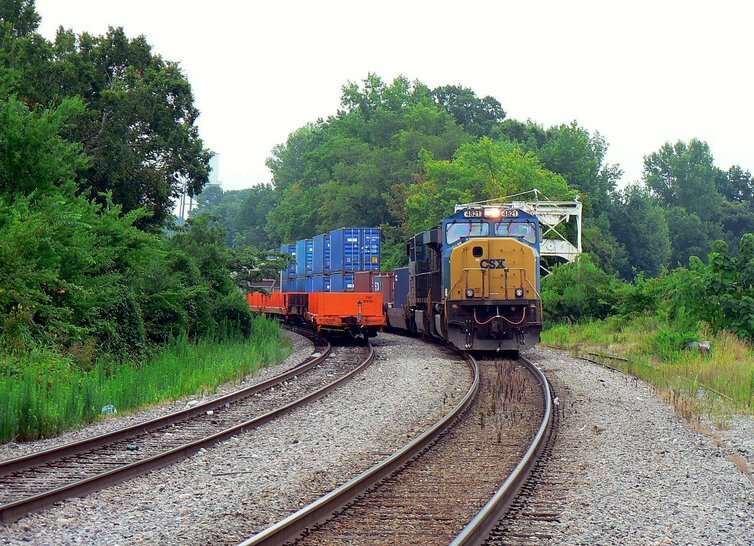 The end of train device (EOT) is visible on the recently arrived Q182 with the Crowley containers. Dan Robie 2010. 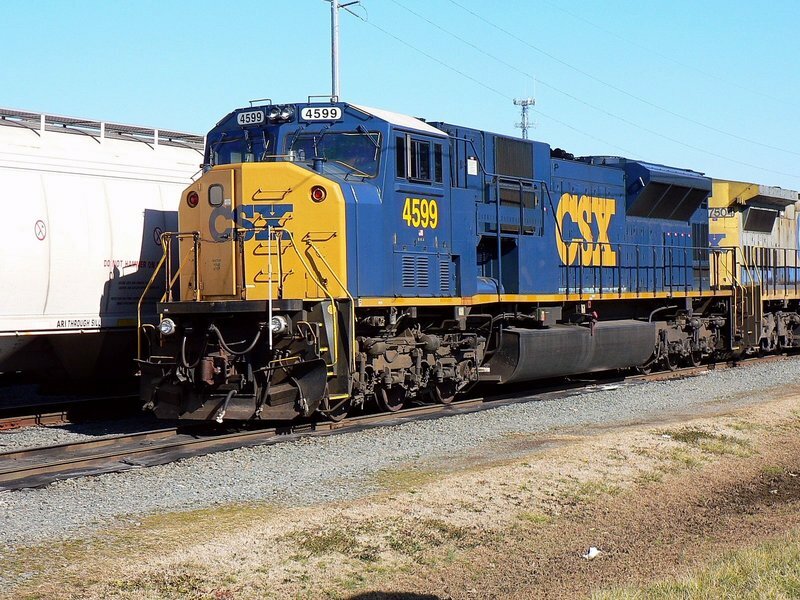 "Triple Nickels" CW44AC #555 at the intermodal ramp. 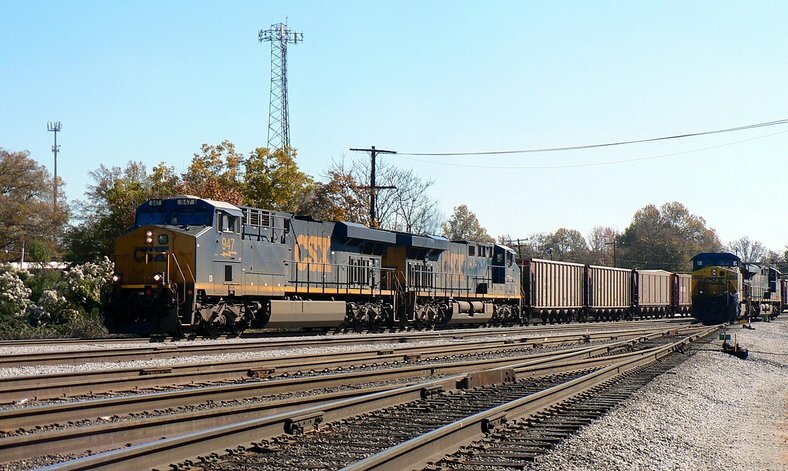 These "coal field" locomotives have earned their keep in other revenue service as well. 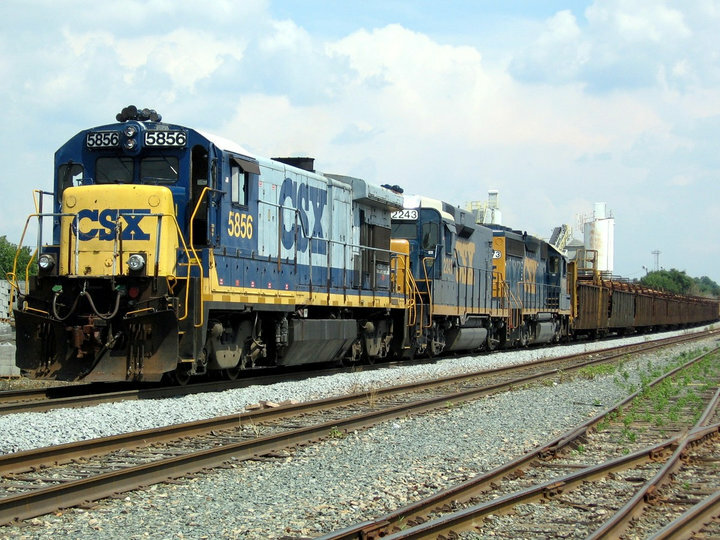 CSX has got its money worth from this class of power. Dan Robie 2010. Q181 brake tests in track P11 this night indicating that it is not especially long. 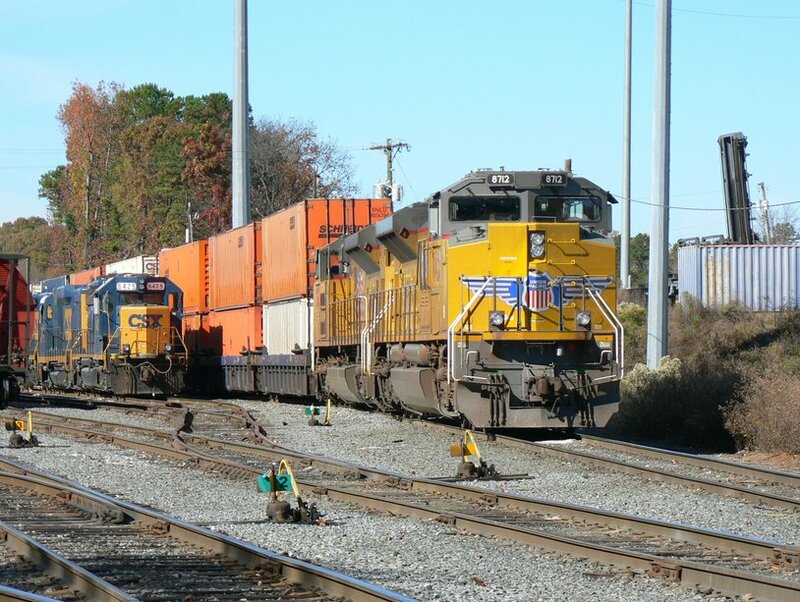 Solid EMD power with SD40-2 #8827 on the lead soon to depart for the run to Savannah and Jacksonville. Dan Robie 2010. 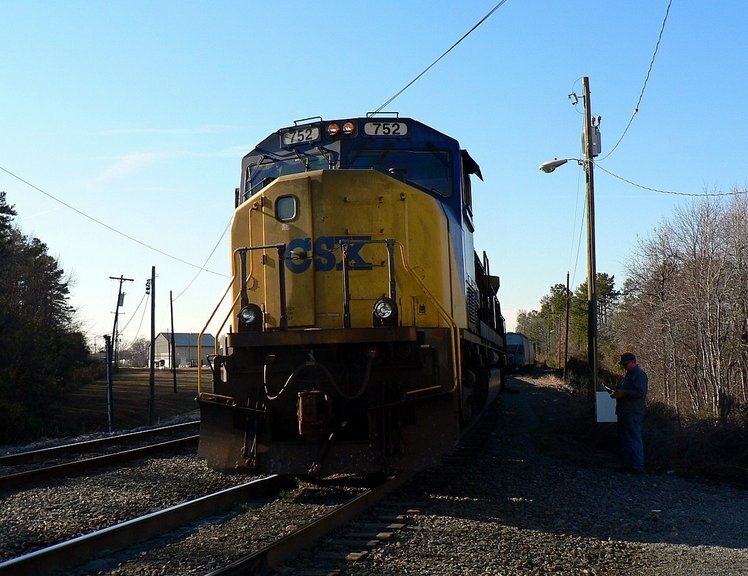 A very late Q697 runs past the ramp as it moves towards its next stop at Bostic. 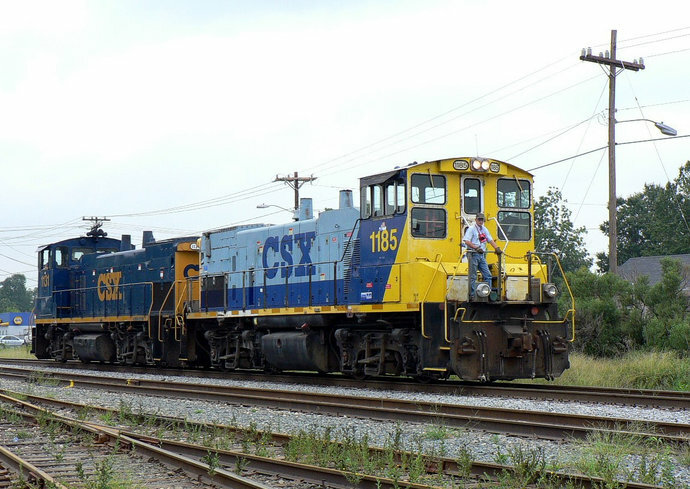 CW 44AC #458 leads another GE and a MP15. Dan Robie 2010. 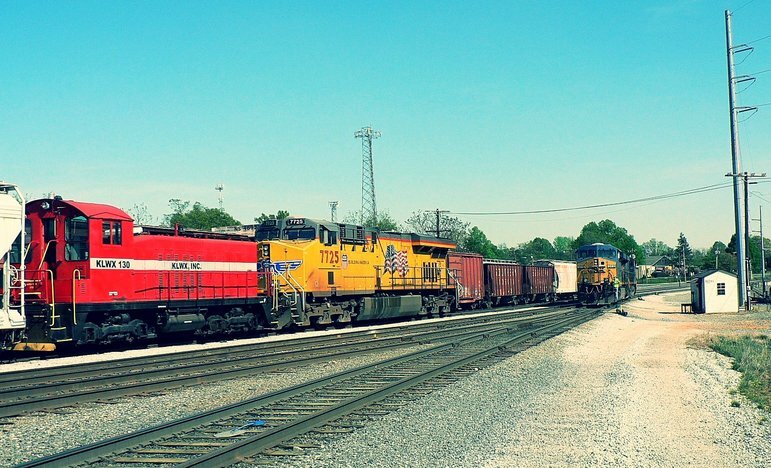 Local power exits the Pinoca Yard lead en route to 84 Lumber along the mainline at Toddville. 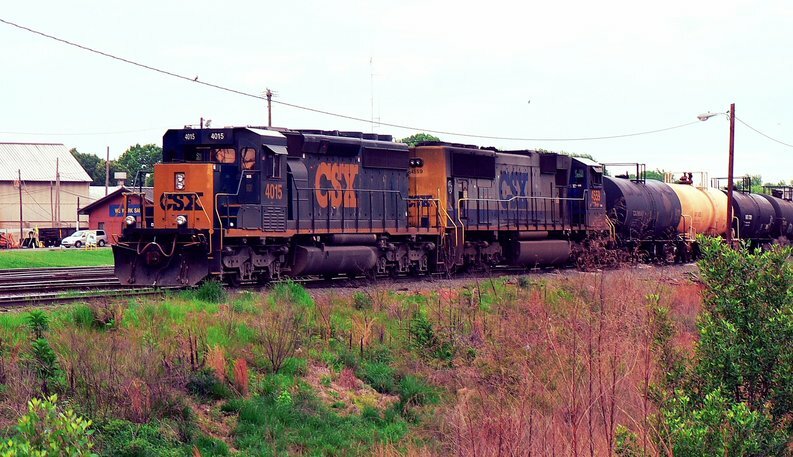 The two GP40-2s (one the mother to the "GP30" slug in the lead) wear a fresh dip of YN3 Dark Future paint. 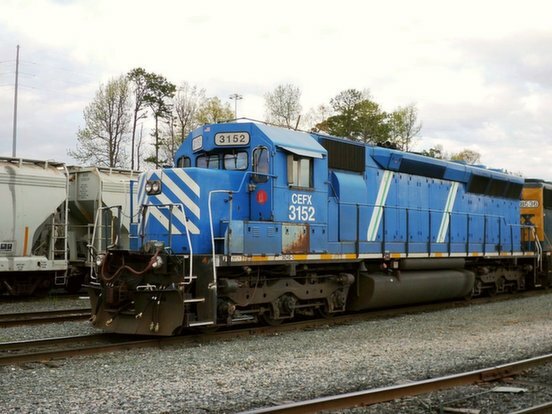 This paint scheme looks best on standard cab EMD power in this observer's opinion. Dan Robie 2010. 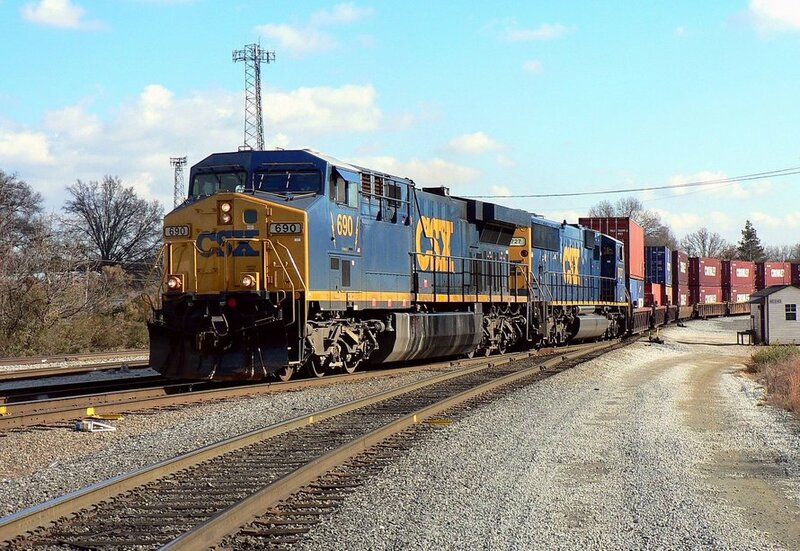 Freight volume continued to increase on both the inbound and outbound trains at the intermodal ramp. 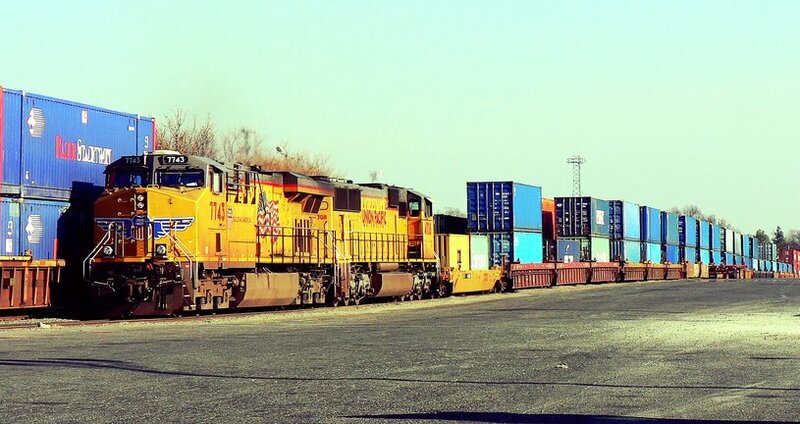 General manifest traffic, too, was on the upswing at Pinoca as shipping began to emerge from the doldrums of the past couple of years. Expansion plans were in the air and the timing could not be any sooner because of capacity. By the year end of 2011, ground was broken and the next phase of expansion at the ramp had commenced. OK--I cheated with this one a little in regards to location. 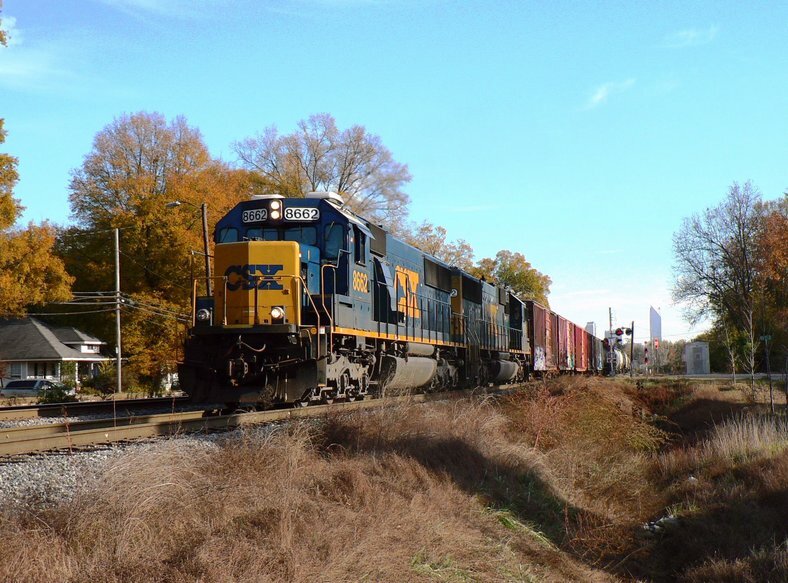 F768 with HLCX SD40-2 #6257 running through Matthews prior to stopping at Monroe on a cool autumn morning. 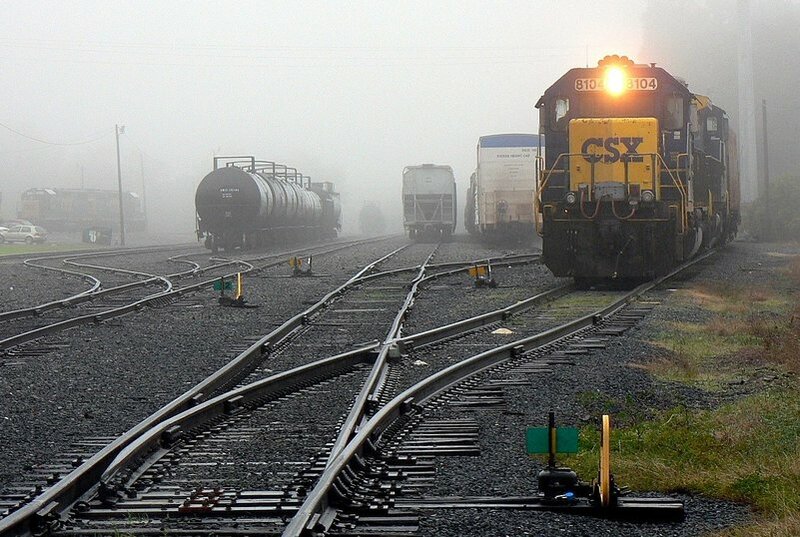 Train originated at Charlotte about a half hour earlier. Dan Robie 2011. SD50-2 # 8552 moves on the ramp lead to pick up a cut of cars. 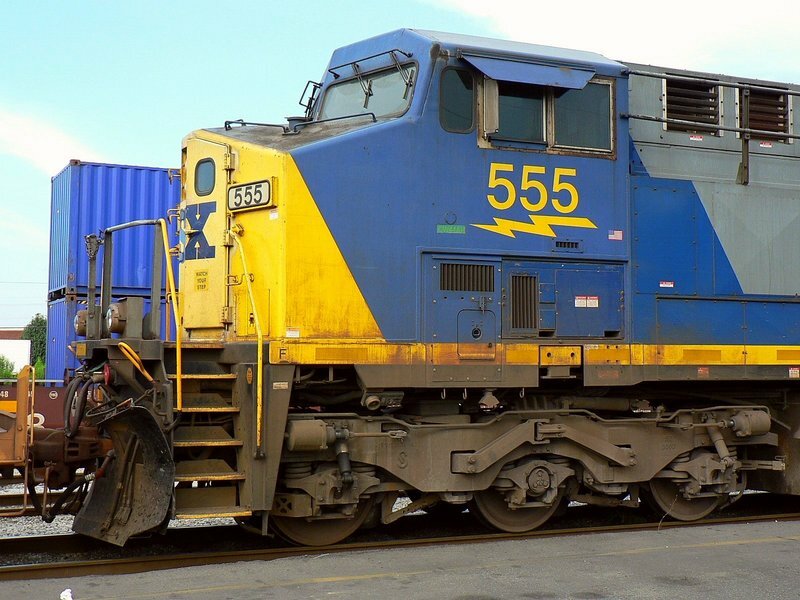 The YN2 paint on this locomotive is certainly looking rough. Dan Robie 2011. To say the year 2012 was loaded with changes at Charlotte would be an understatement. 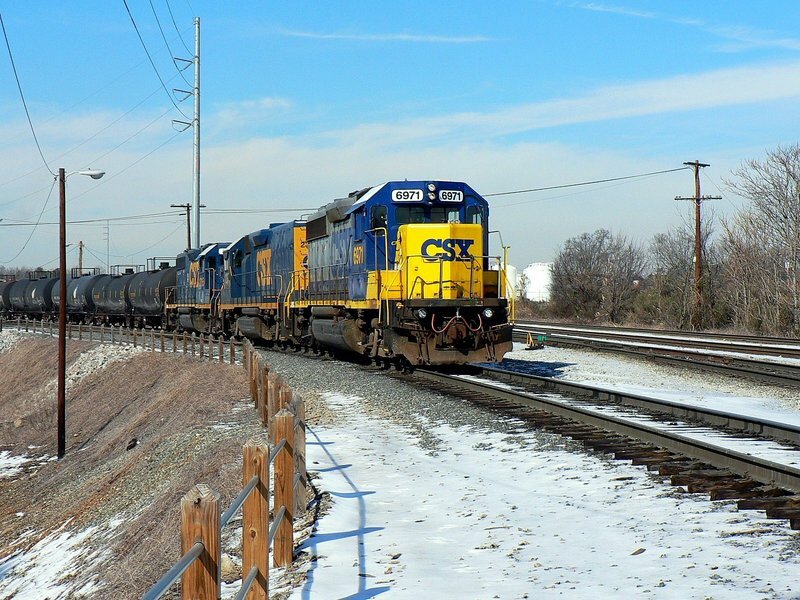 A large expansion project characterized the entire year as south end leads were added at the intermodal ramp creating a second connection to the mainline. 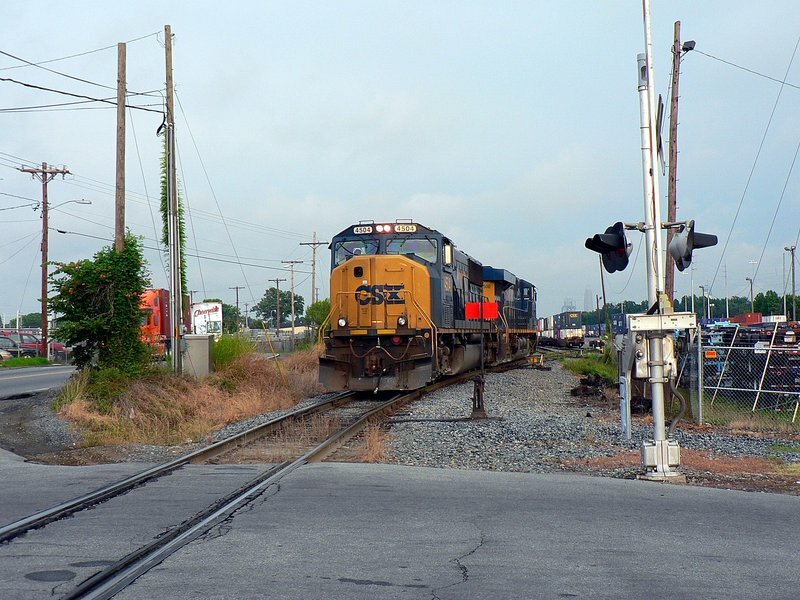 An auxiliary track adjacent to the main was extended from the Old Mount Holly Road grade crossing to the Interstate 85 overpass. 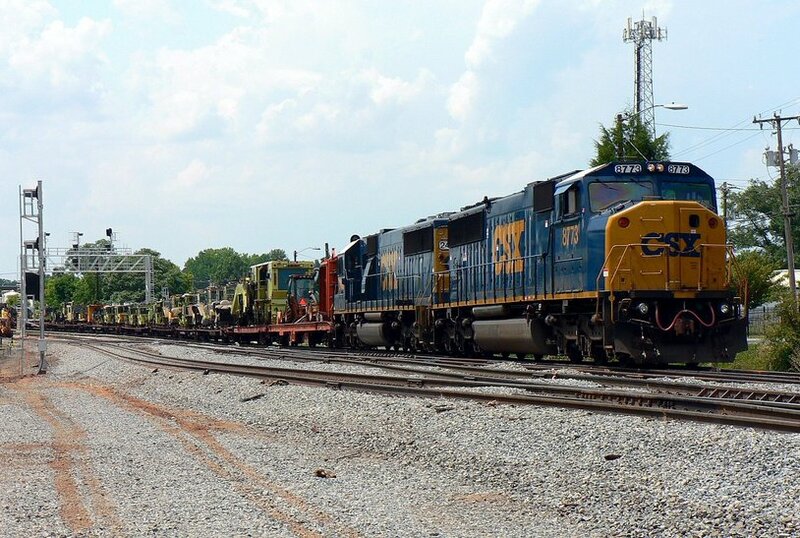 Tracks were realigned and new crossovers were also added. 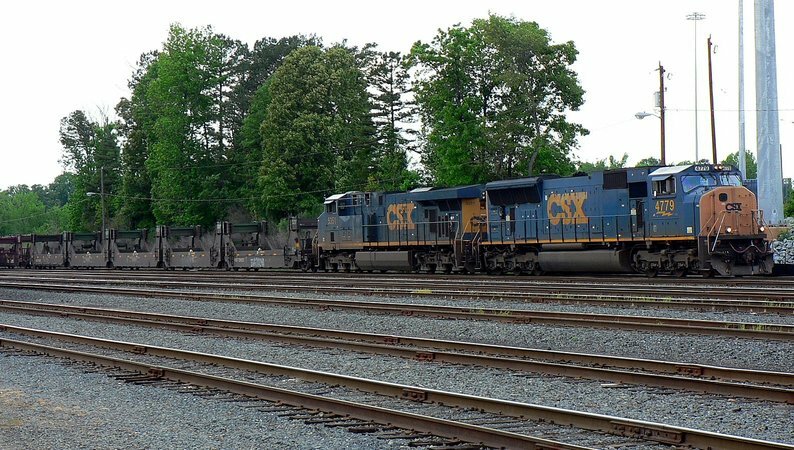 Visually, the most noticeable change was the addition of signals within the former Charlotte yard limits. 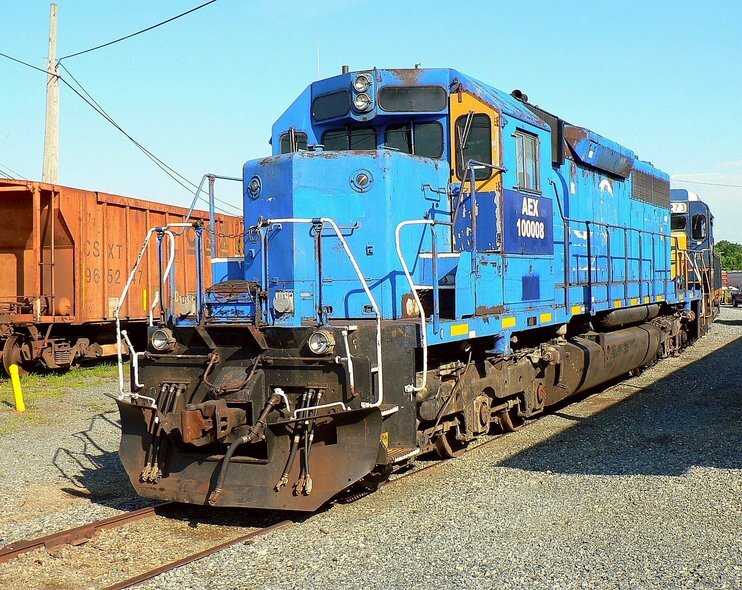 Functions once controlled by the Pinoca yardmaster now fell under the jurisdiction of the FC Dispatcher at Florence. 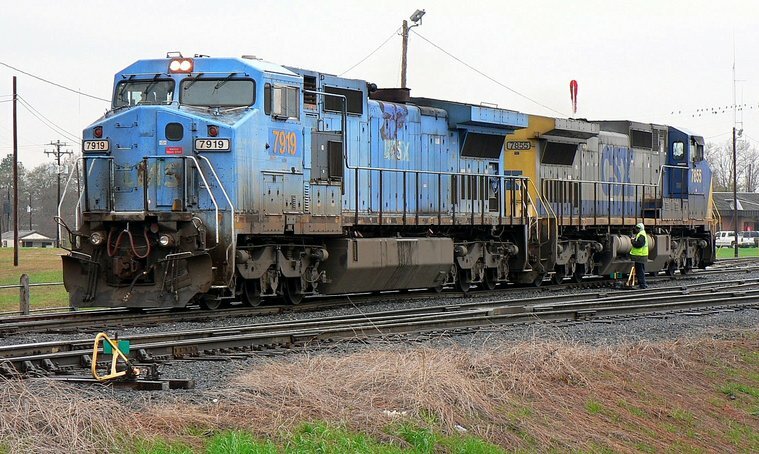 Train symbol changes were in evidence. During mid- year, Q199 became Q195, the Threads Express was changed from Q181/Q182 to Q037/Q038 and variants. 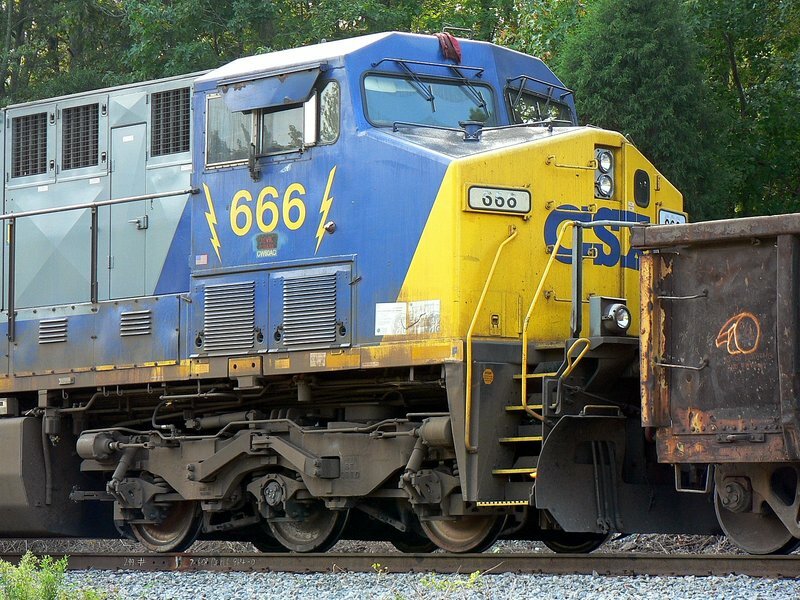 By years end, F768/F769 had morphed into Q468/Q469. One of the tasks assigned to me was to create a photo documentary of this project that commenced late 2011 and completed late 2012. This was undertaken as both a reference for future projects and, of course, a matter of historical record. I hope to share some of these images at a future date but at this point in time, do not have rights to do so as the finished product is the property of the company. 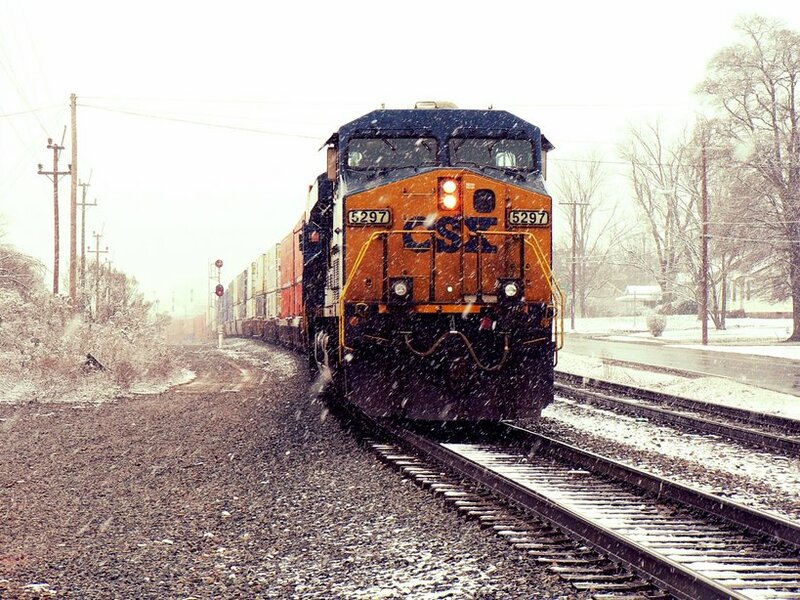 From an operational standpoint, the year was filled with challenges and primarily at the intermodal ramp. 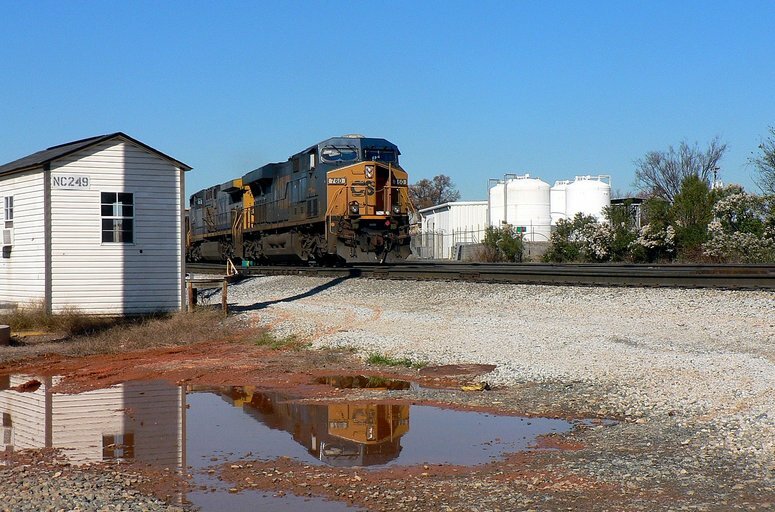 Obstacles affecting fluidity of work were tracks taken out of service as the project expanded, operational curfews, and the spotting of cars to the ramp at specific time windows. 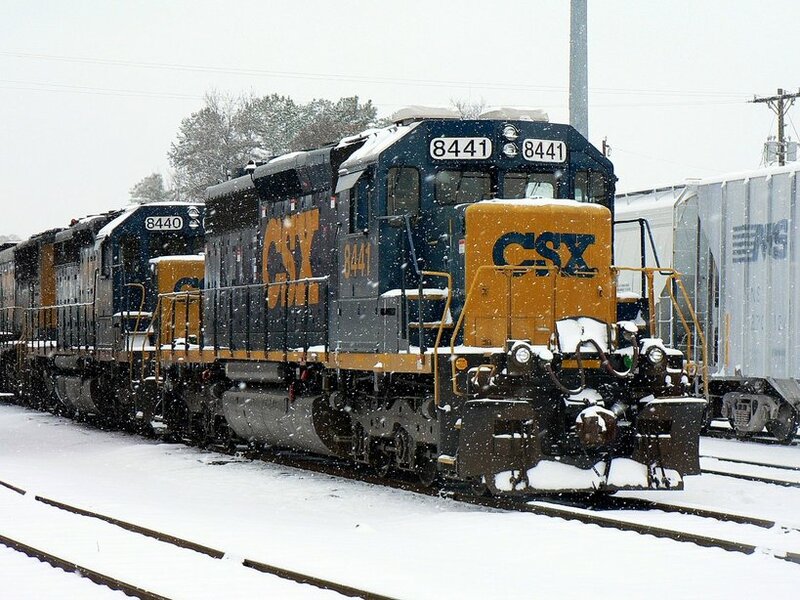 CSXT and CSXI choreographed the operation as smoothly as possible and in spite of all the challenges, managed on time departures throughout the year. This was teamwork at its finest --to accomplish this safely and efficiently was a notable achievement. 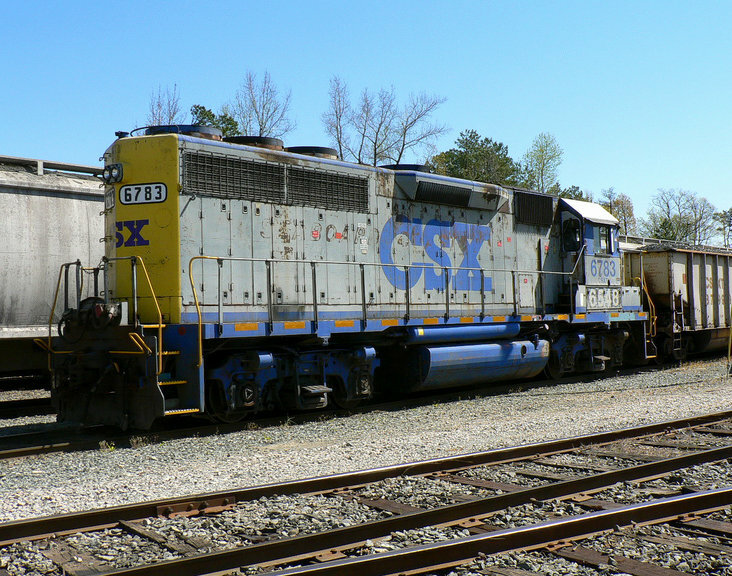 A new face on the CSXT roster added the previous year is the SD40-3. Ready for departure on one of the last trains to operate with the F768 symbol. Dan Robie 2012. 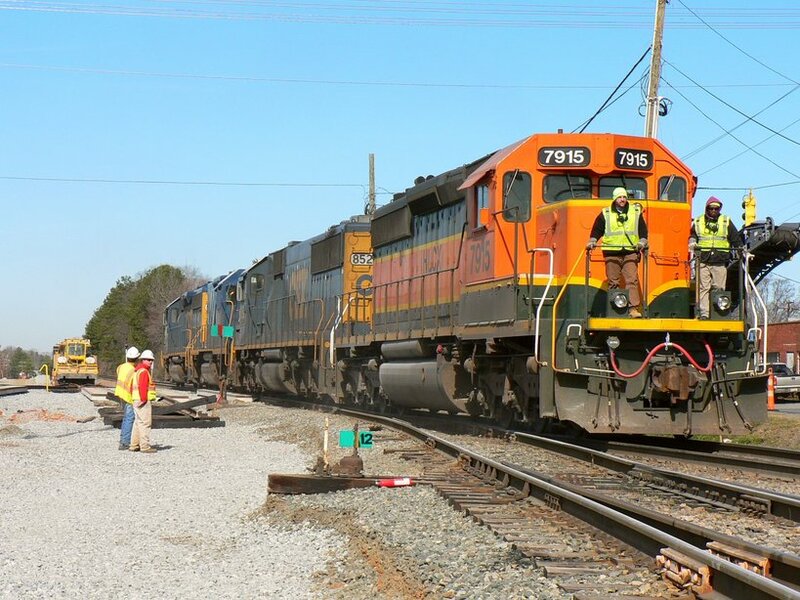 A maintenance of way train passes beneath the new signal bridge outside of Pinoca Yard. 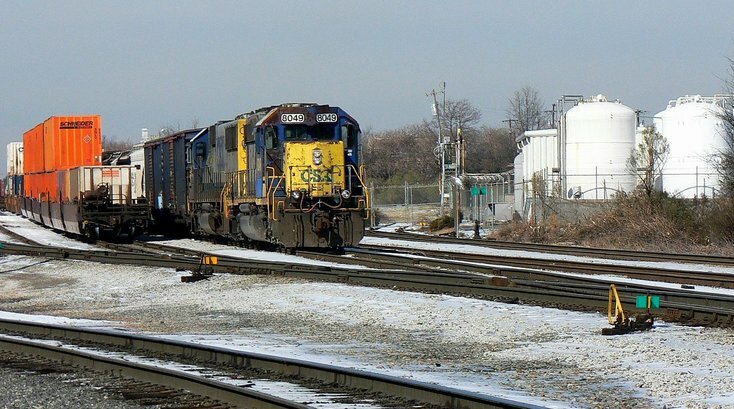 This control point is named "North End Pinoca" and at left is the outbound signal for the yard. 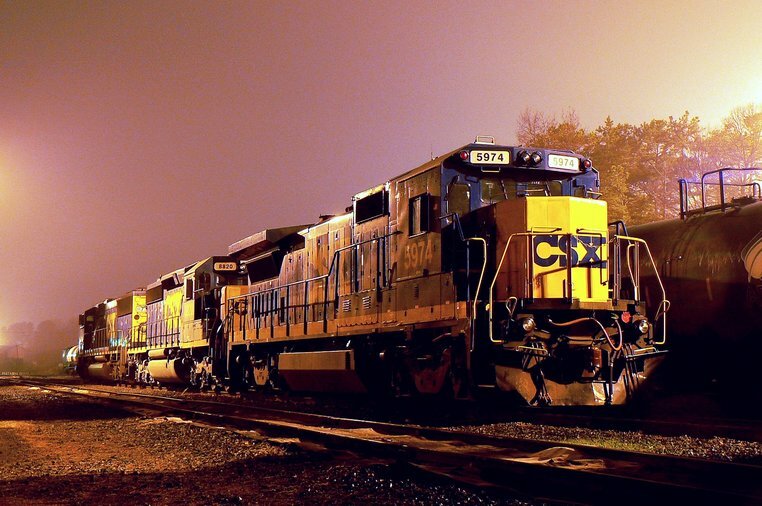 Shiny YN3 on the SD60M and SD50-2. Dan Robie 2012. 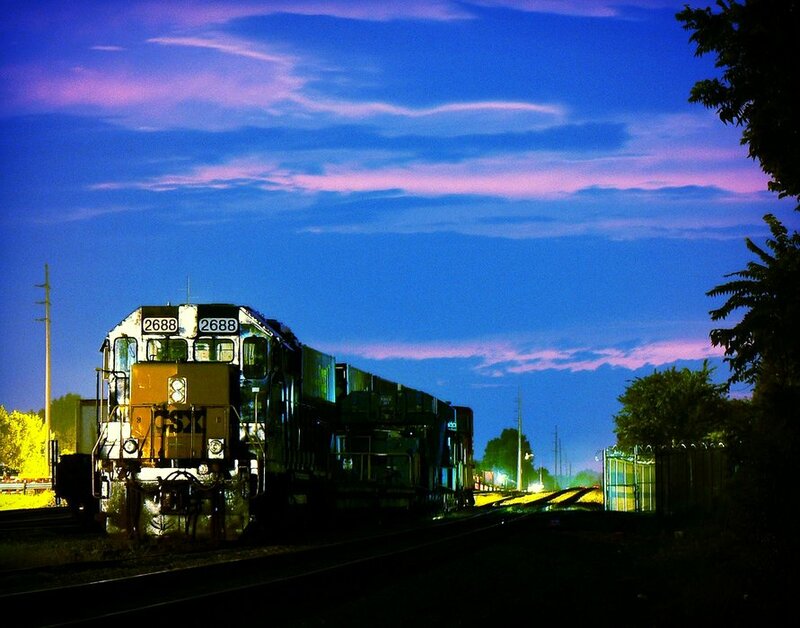 High and wide train W037 is tied down in the outer yard during a purple hazed dusk. This run has returned from Marshall Steam Station on the Terrell Sub after delivering a turbine. Dan Robie 2012. 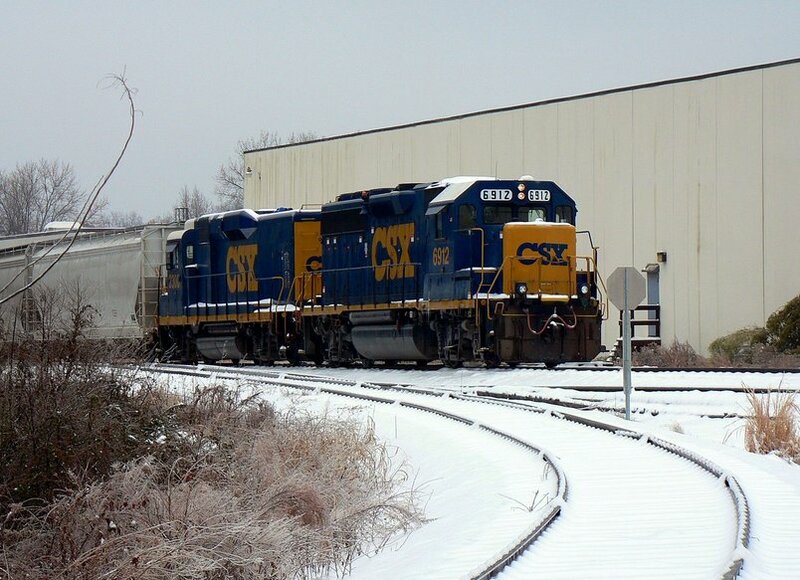 2013 began the first full year after the ramp and track expansion and the productivity increased proportionately. 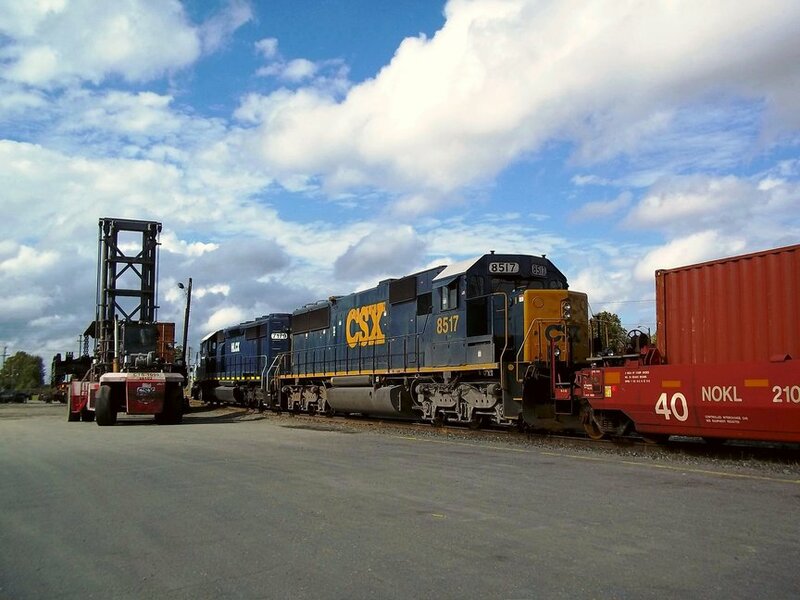 The Charlotte terminal shattered its previous lift totals and in conjunction with CSXT, became a truly integrated operation in regards to the intermodal trains. 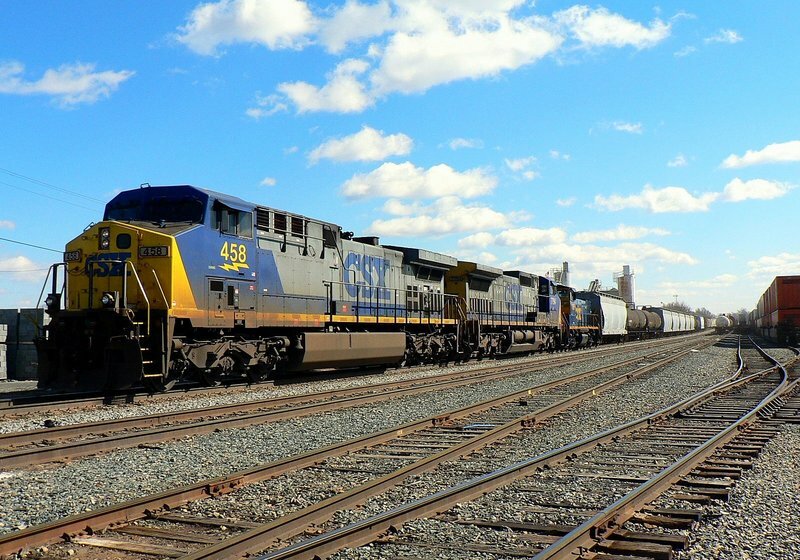 The Q468/Q469 trains increased in volume as rail carloads continued to increase. From a personal standpoint, the number of photographs continued to decrease although a camera was kept close at hand for one of those days that offered a great opportunity. 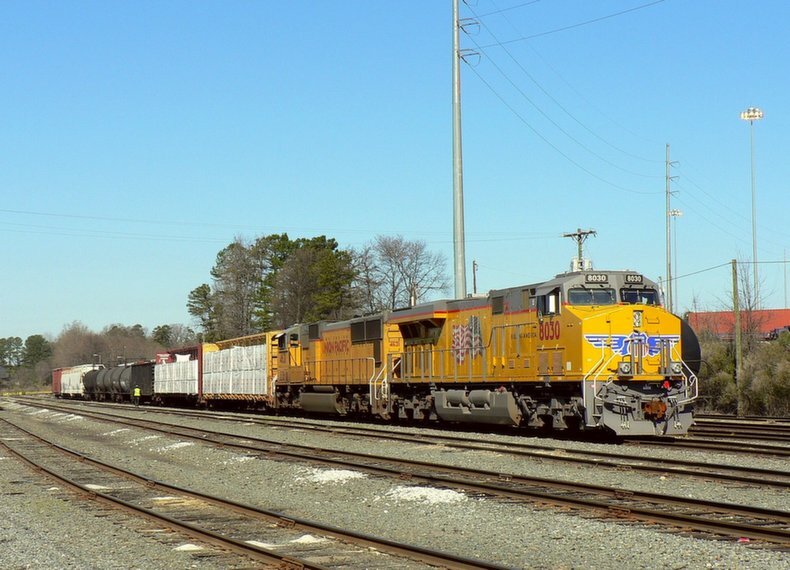 Canadian Pacific ES44AC #8929 and running mate on P01 track which was power on the K447 ethanol train for TRANSFLO near Mount Holly. 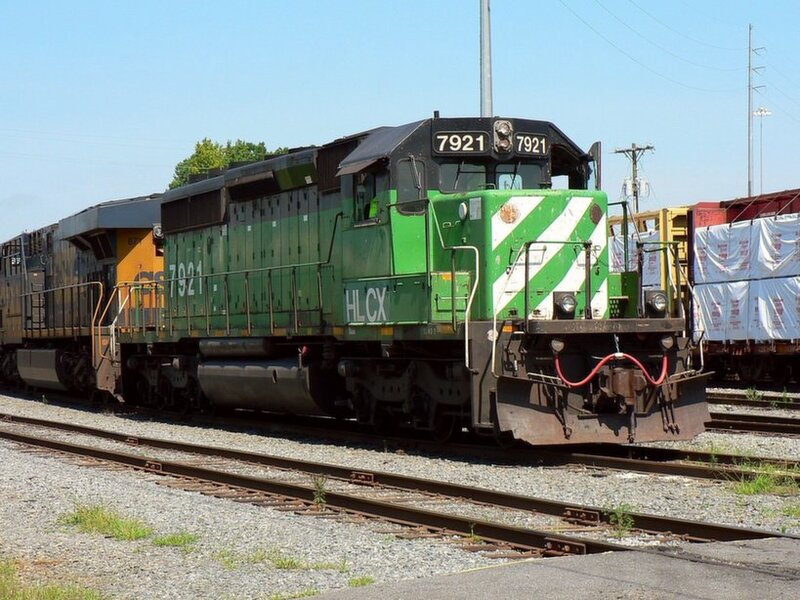 The locomotives on these trains are occasionally run up the P&N to Pinoca and sent to Hamlet on Q468. Dan Robie 2013. 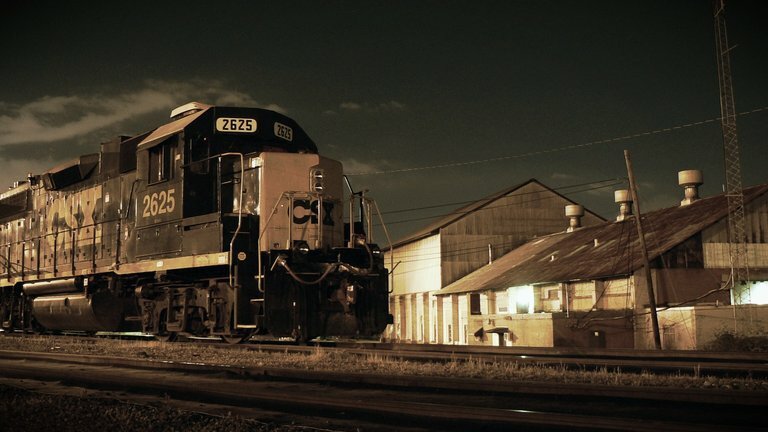 GP38-2 #2625 in a grayscale conversion. The P&N car shop completes the scene in the background. Dan Robie 2013. All indications of the future are portents of increased volume and expansion. 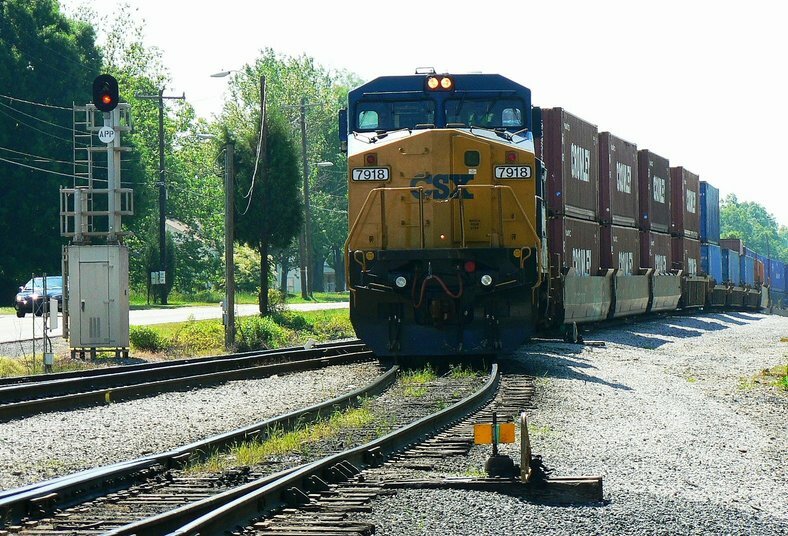 The intermodal terminal is slated for additional expansion and there will without question be at least one more train added to the lineup. The only mystery at this point is which service lane it will be. At this point, I will likely not add to this page but rather create a second one in the future. Even if that does not come to pass, I am content with the sampling of trains and locations here. UP power from Q194 in temporary use at the yard until time to build Q195. Fairly common practice with road power at Pinoca when all other units are busy. Dan Robie 2014. This pictorial is in tribute to the employees at Charlotte, both past and present, whom I have come to know and work with as either friend or colleague. Mutual respect, accomplishments the product of teamwork, and each others well being the guiding spirit.